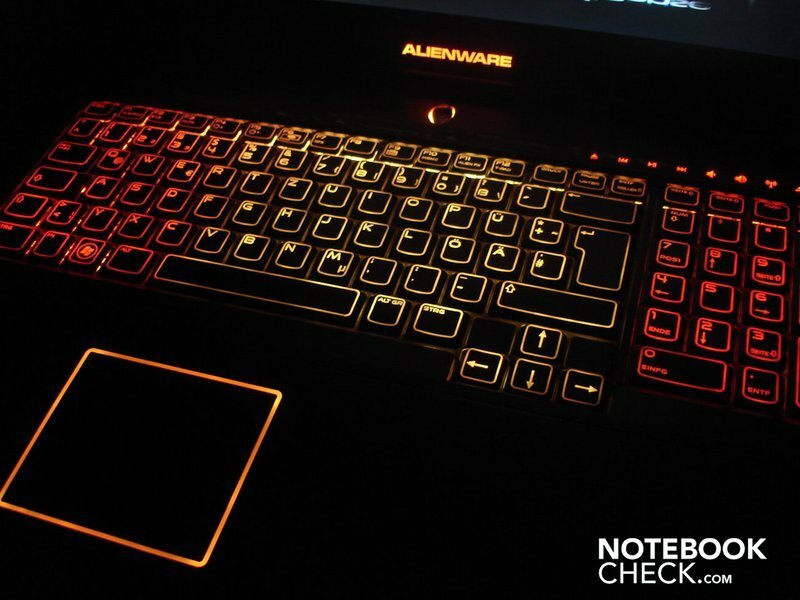 In the meantime, Alienware offers its 17.0 inch luxury notebook, M17x, with a wickedly expensive combination of two ATI Mobility Radeon HD 4870s, also called HD 4870 X2. The HD 4870 doesn't support DirectX 11, but is still one of the fastest mobile graphic cards. The HD 4870 X2 is supported by a Core i7-620M, which is clocked up to 2.66 GHz, so to prevent the performance from slowing down. 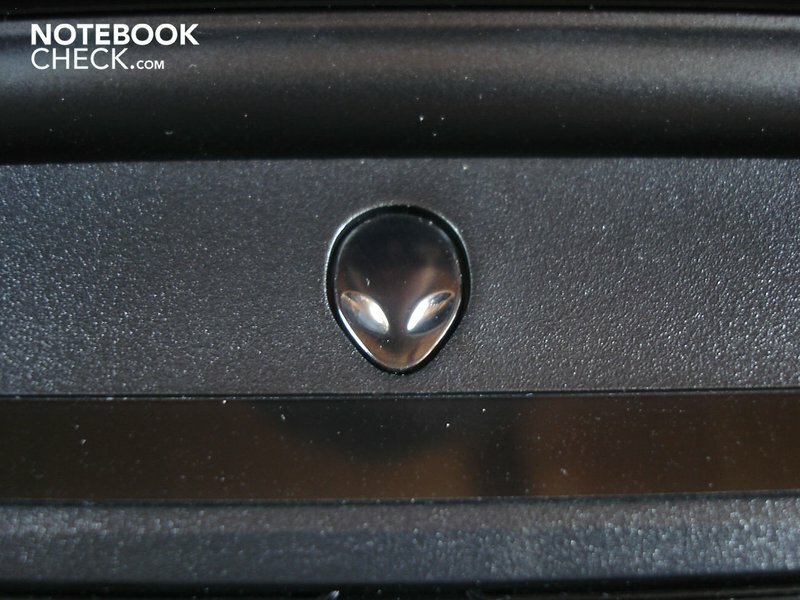 Read in our review if the Alienware M17x is worth its expensive price and how the not exactly power saving components effect temperature, system noise, and battery life. 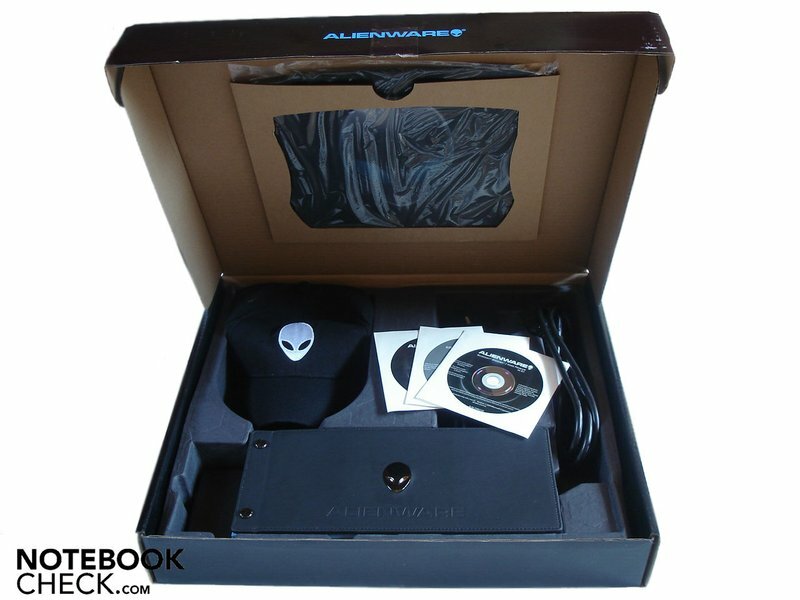 As typical for Alienware, the M17x's components can be configured in many ways and thus be customized to suit personal needs and wishes. One of the most difficult decisions is already waiting in color selection. Aside from the black tested by us, there is also silver and red to choose from. The processor comes from Intel's new Core i5 or Core i7 range. The bandwidth of both dual-cores range from a Core i5-520M (2.40 GHz, turbo boost up to 2.93 GHz) up to a Core i7-620M (2.66 GHz, Turbo Boost up to 3.33 GHz). 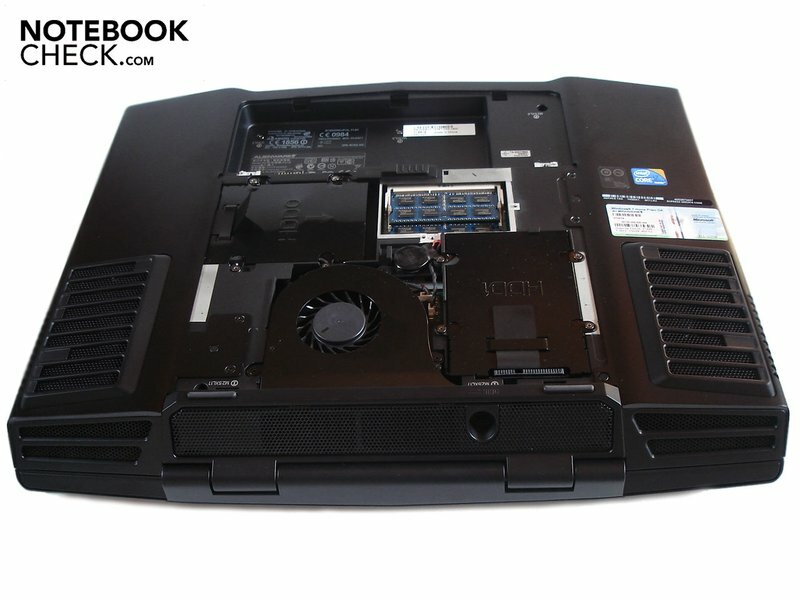 In return, the Core i7-820QM (1.73 GHz, turbo boost up to 3.06 GHz) and the Core i7-920XM (2.00 GHz, turbo boost up to 3.20 GHz) are available as quad-cores. In any case, a 64 bit version of Windows 7 (Home Premium Professional or Ultimate) is pre-installed as the operating system. 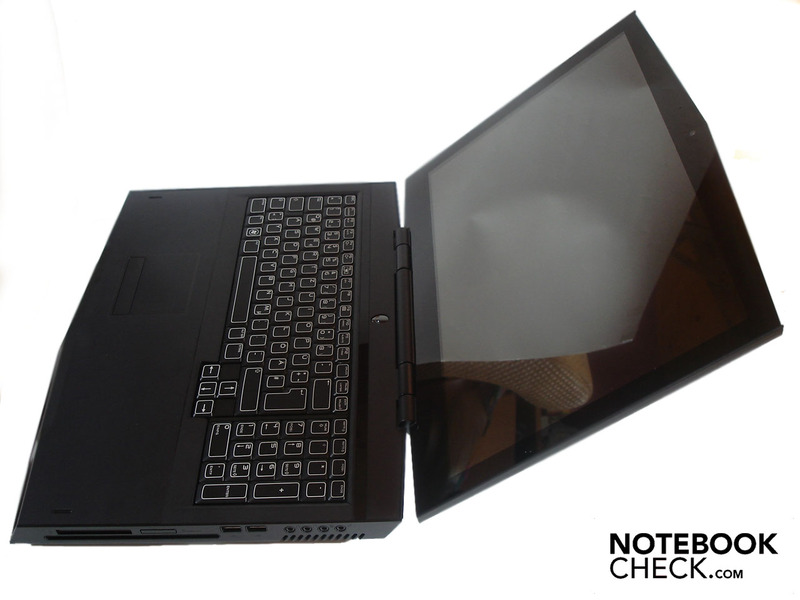 The 17 inch dual CCFL display in a 16:10 format is either available in a resolution of 1440x900 or 1920x1200. 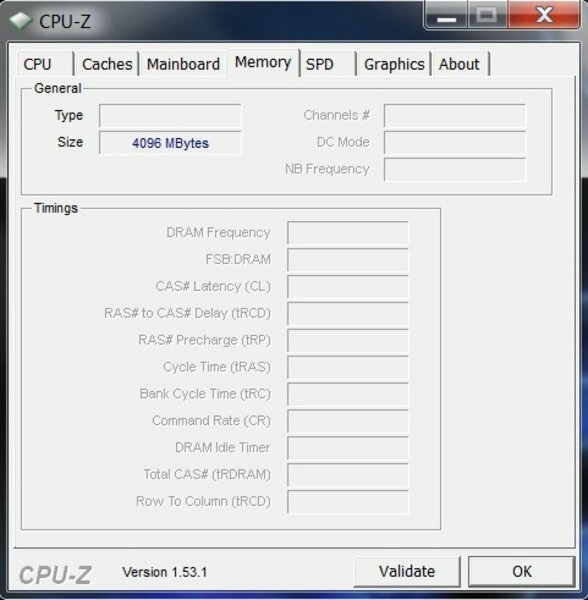 Furthermore, the RAM capacity of the applied DDR3 RAM (1333 MHz) is between four and eight GBytes. Two HDDs with a capacity of 160-640 GBytes do their job in the RAID 1 array. With RAID 1, the data is mirrored so that only half the capacity is available in practice (so there aren't 640 GBytes available with two 320 GBytes, but only 320 GBytes instead). This way the data isn't lost in the case of a hard disk death. 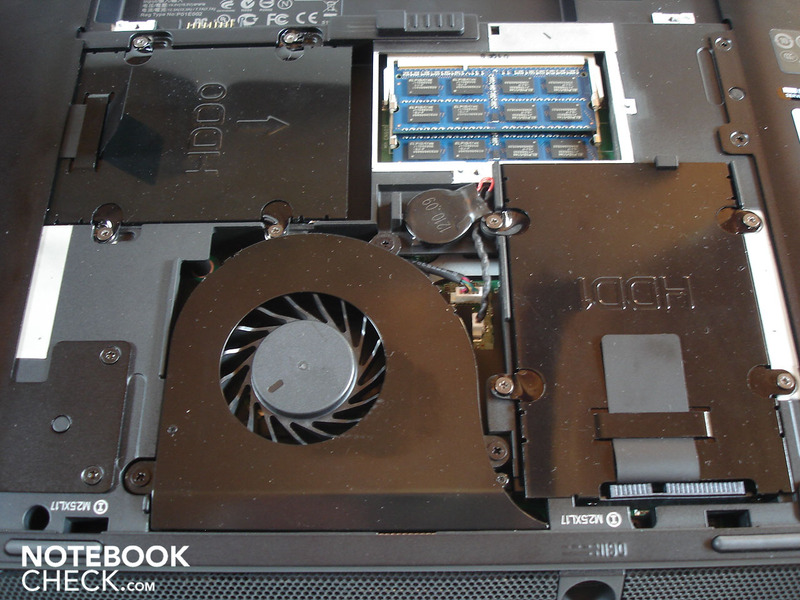 But back to the M17x: As already mentioned, a single or even two Mobility Radeon HD 4870s in a Crossfire array (HD 4870 X2) is used as graphic cards. 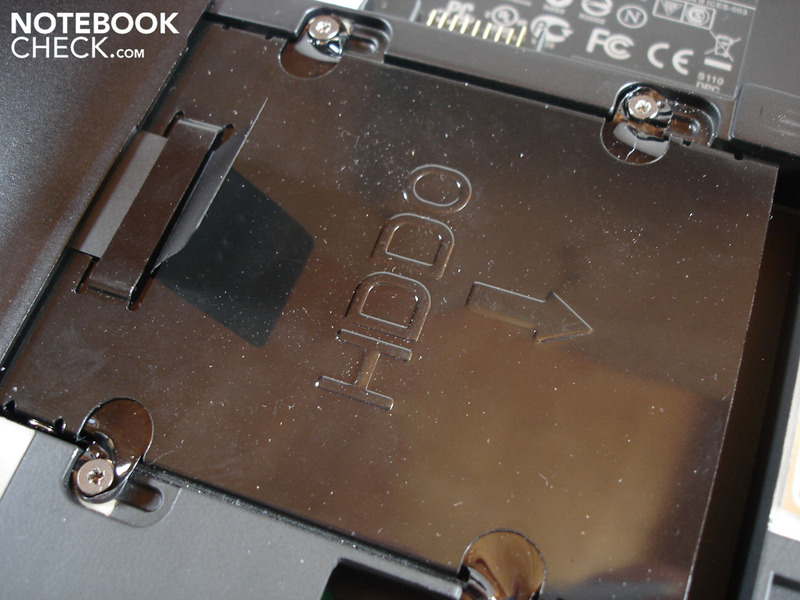 A DVD burner, a BluRay drive (burns DVDs, CDs) or a BluRay burner is integrated as an optical drive. A strong nine cell lithium ion battery with 85Wh, which is already included in the standard configuration, takes care of mobility. 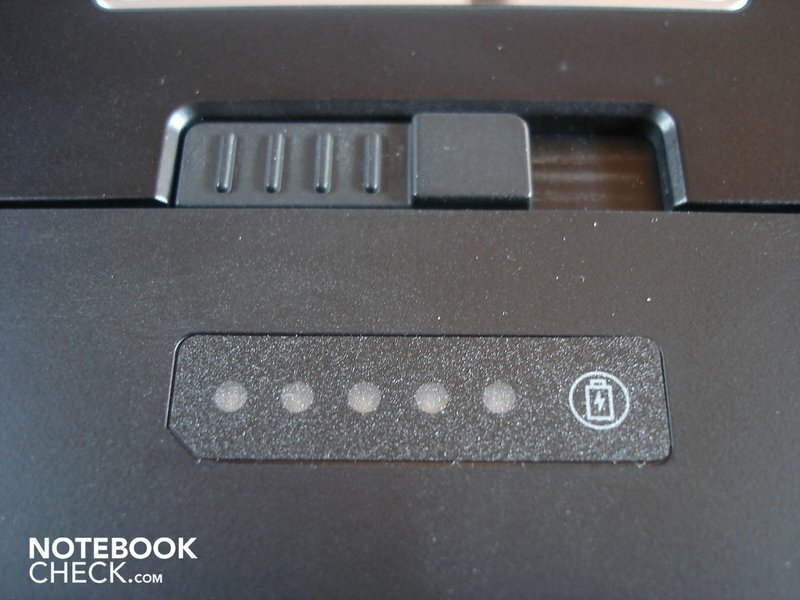 Also already found in the standard configuration is Bluetooth (Dell Wireless 350) and WLAN (Dell Wireless 1520). 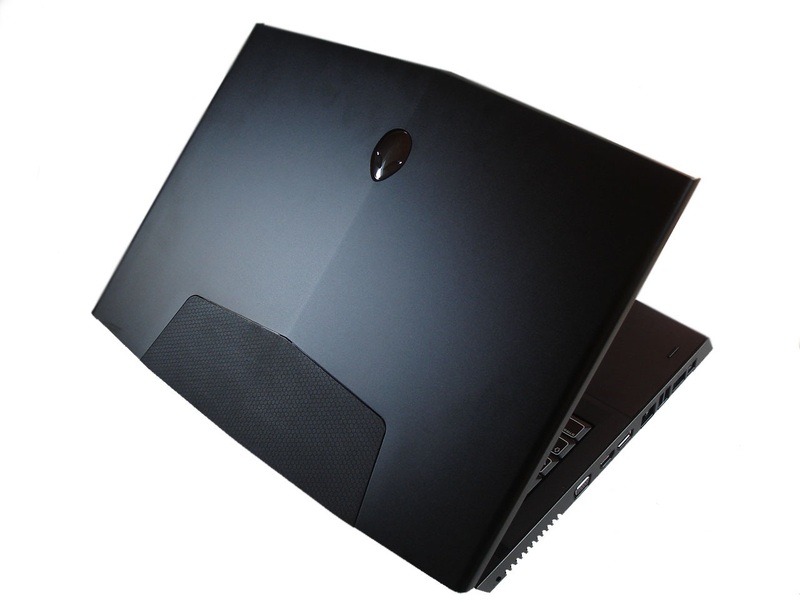 By the way, the prototype, provided by Alienware, with a FullHD display, a Core i7-620M, a 4 GByte RAM, the Radeon HD 4870 X2, a DVD burner and Windows 7 Home Premium added up to 2382 euro at the time of the review. 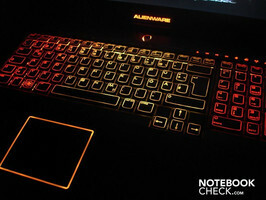 The Alienware M17x's case probably belongs to the best samples available on the market at the moment. 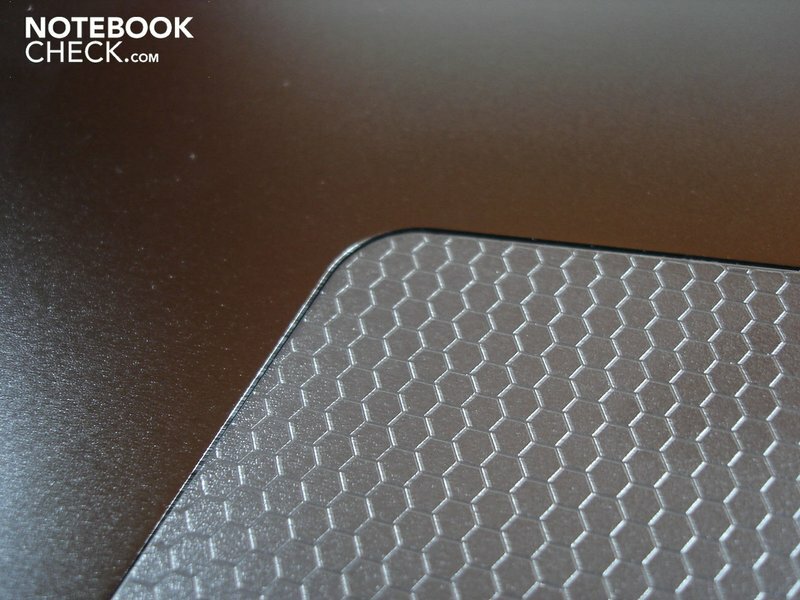 The case has a very high-end look because of the aluminum used on its exterior and is very stable, but counters with a very heavy 5.5 kilograms. 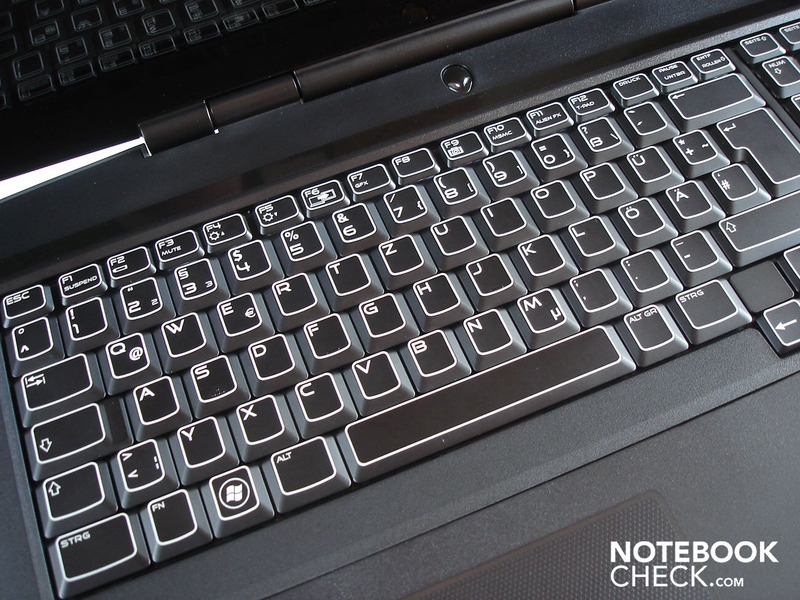 The Alienware M17x is also fairly resistant against smudge and fingerprints due to the matt surfaces (with exception of the display bezel). 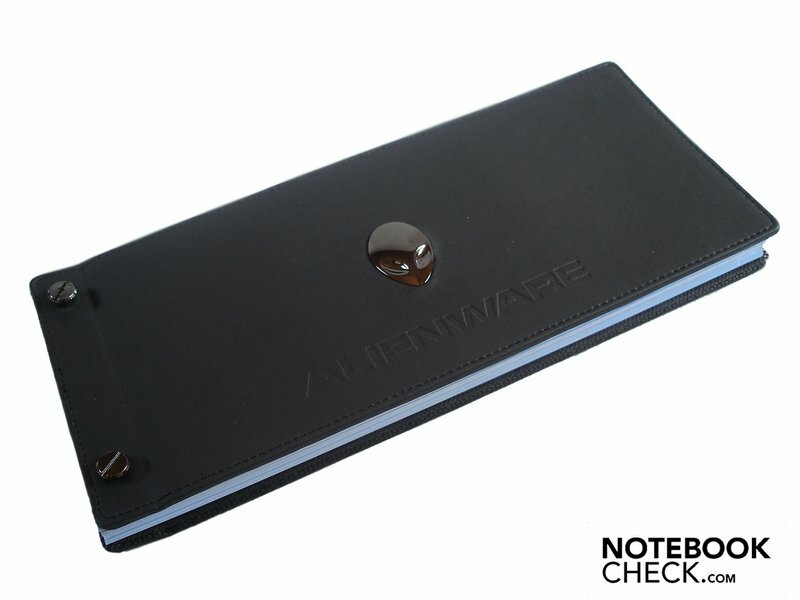 The workmanship, as known from Alienware, has a high standard, even if the case has some extremely hard edges and creaks partly due to its construction. The M17x is a class of its own in terms of design. Barely any other manufacturer knows how to create such a masterly, a so chic and, at the same time, so elegant appearance. 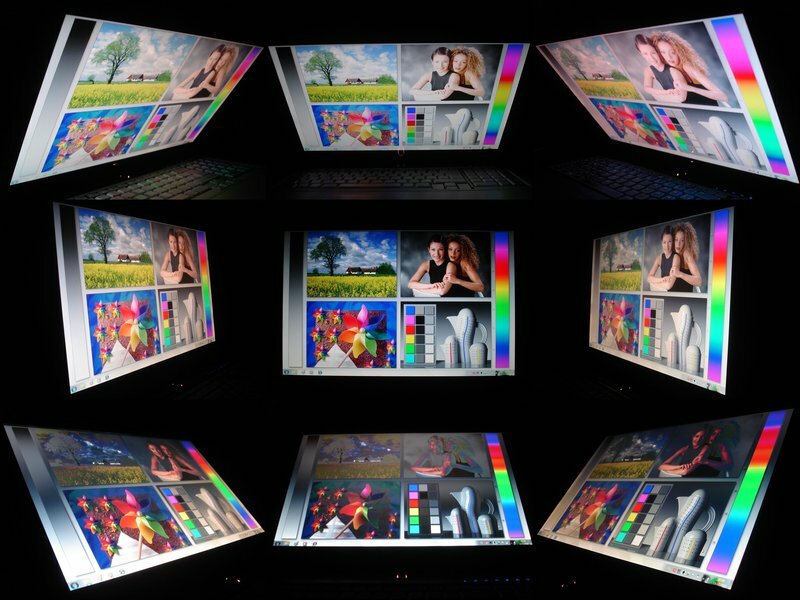 The extensive illumination is further on a big highlight, and is divided into several, independent of each other areas and can be easily be adjusted with the pre-installed software. You can create a monochrome or even a totally color-crazed pattern depending on your taste, as you can see in the pictures. Let's now finally take a look at the hinges, which are extremely stable and keep the display perfectly in position, but can often persuade the case to lift evidently. The buyer can expect a premium configuration at this premium price. 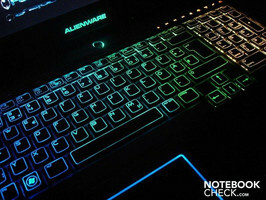 Alienware supplies this and exceeds other manufacturers by lengths. 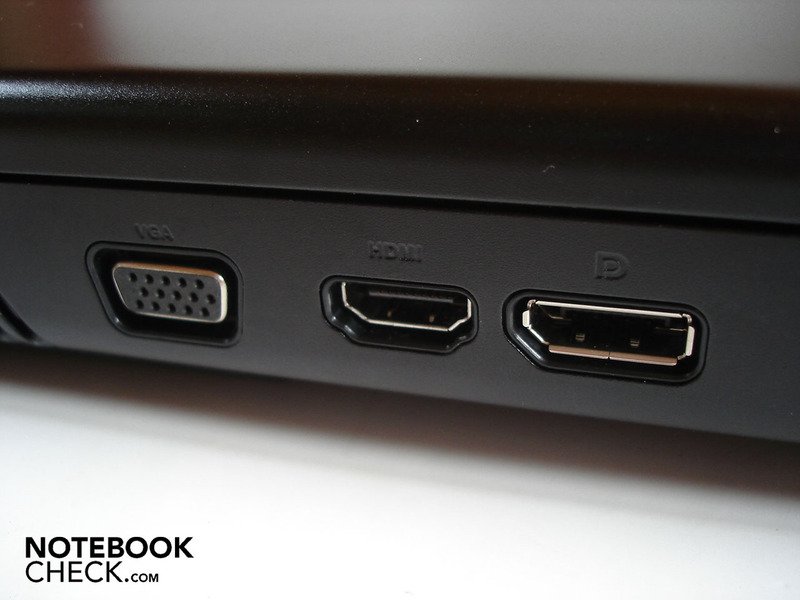 A Kensington security slot and even three display ports, as VGA, HDMI and display port, wait on the left as connections. They are followed by a RJ-45 gigabit LAN, two upright USB 2.0 ports, an eSATA/USB 2.0 combo and a Firewire port. 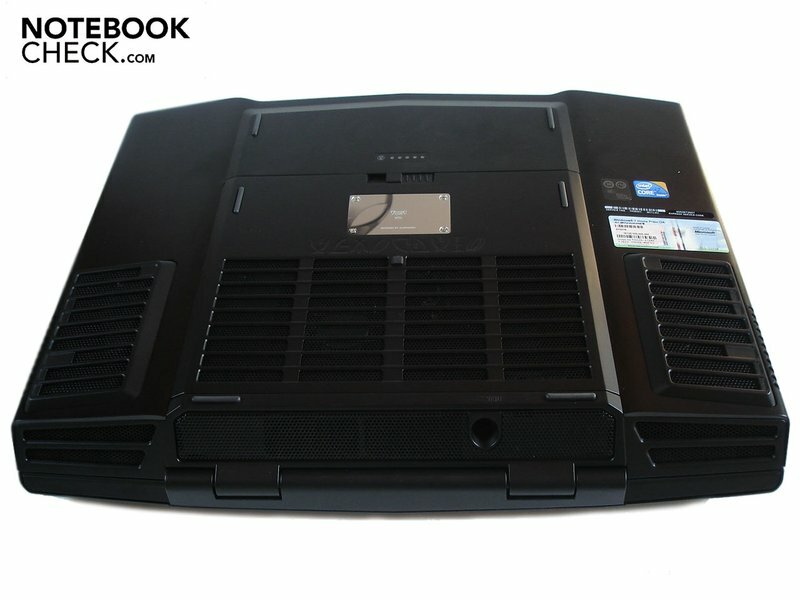 In return, the right accommodates the optical drive, above which an 8-in-1 cardreader and a 54mm Expresscard slot has been placed, whereas the latter may very well obstruct the drive when its occupied. This is completed by two further USB 2.0 ports (so it's a total of five) and four audio sockets, which are even able to send a full-fledged surround signal to external sound systems. 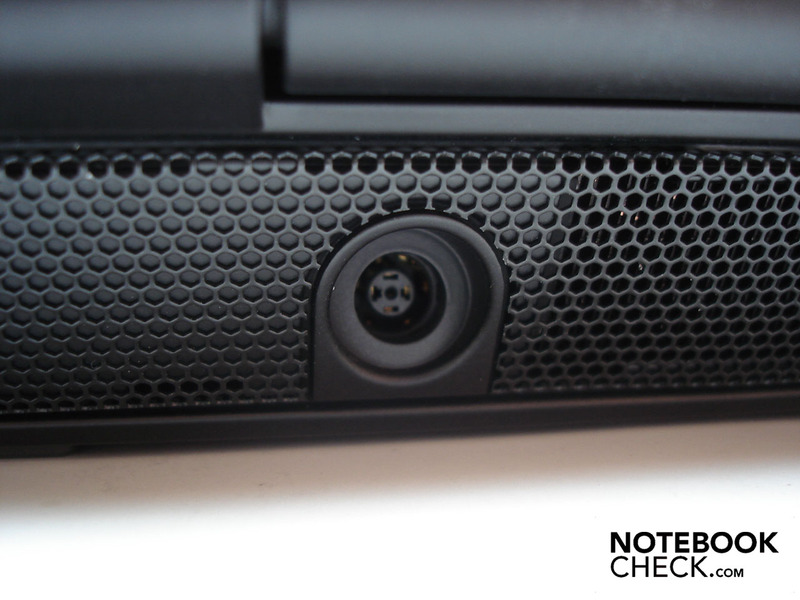 Otherwise, the M17x also has a WLAN and Bluetooth module, as well as an integrated webcam. 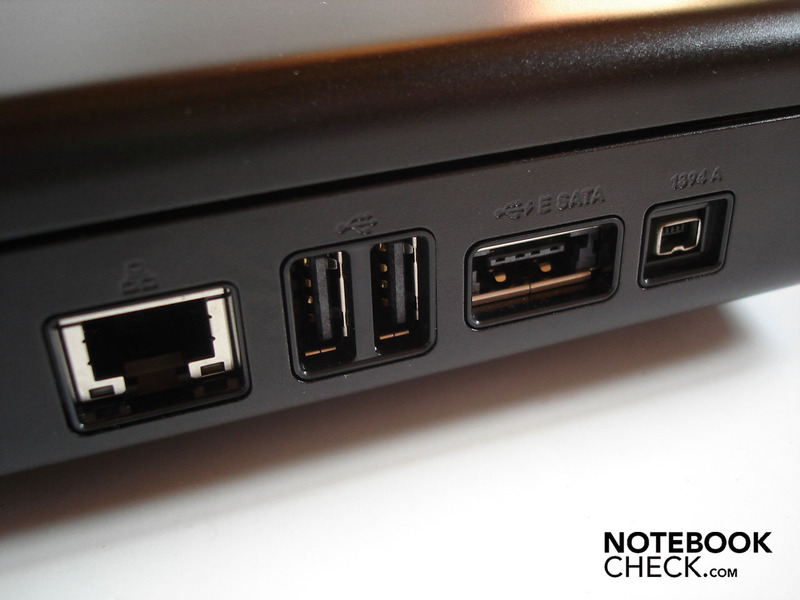 We like the right port distribution a lot (except for the Expresscard problem). However, we found the left as unfortunate. For one thing, lefties will face a cable pile up when a mouse and many connected cables are connected. For another, most connections were placed too far front even for us righties. The DC-in positioned on the rear's center is just as unpractical and first needs to be found. The M17x's software installation is agreeably slim. 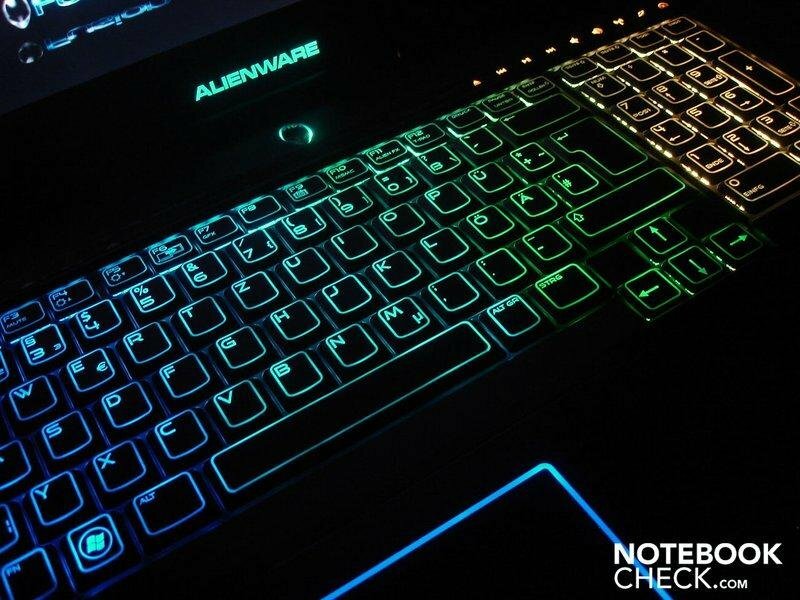 Alienware has basically left out senseless ballast, except for a few really handy programs. 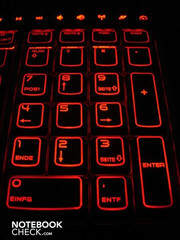 The heart is probably the so-called Command Center. Apart from the energy savings options, the extensive illumination can be adjusted down to the smallest detail and stored in various profiles. 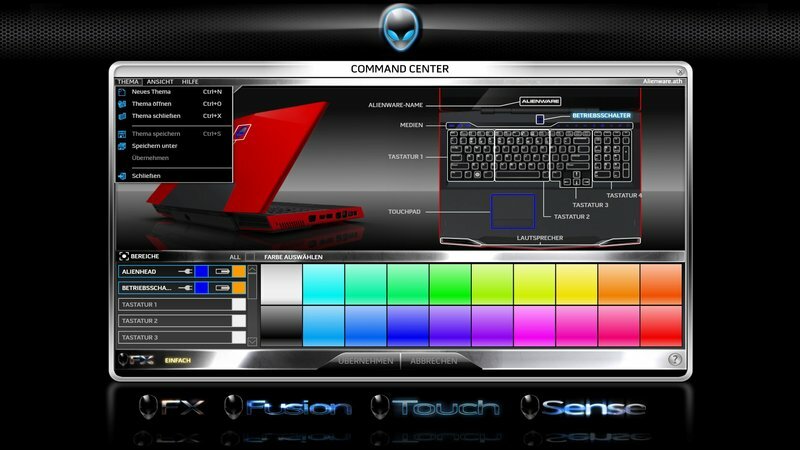 Furthermore, the security level and detailed touchpad settings can be tuned. 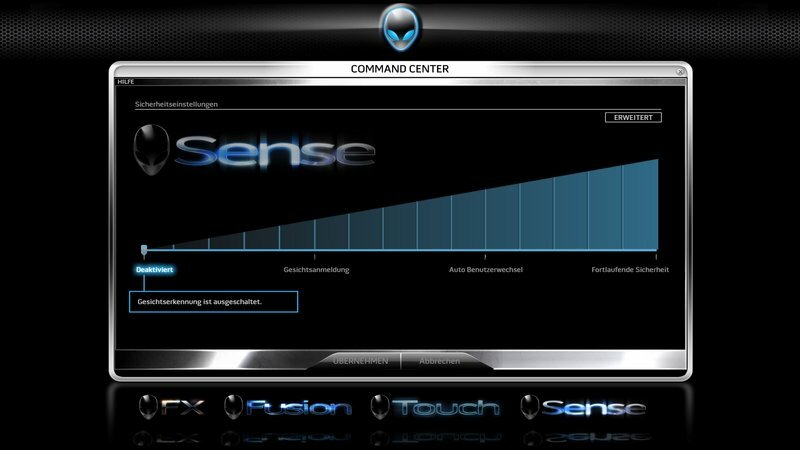 The Command Center's design is very attractive, the menu navigation and the single options are intuitive and clear. Also, the Command Center's stability and speed has been improved since our last review (M15x) and thus, there aren't as many crashes or error messages. Moreover, there is also a resource DVD, so a driver DVD, and a DVD with the operating system in the box. 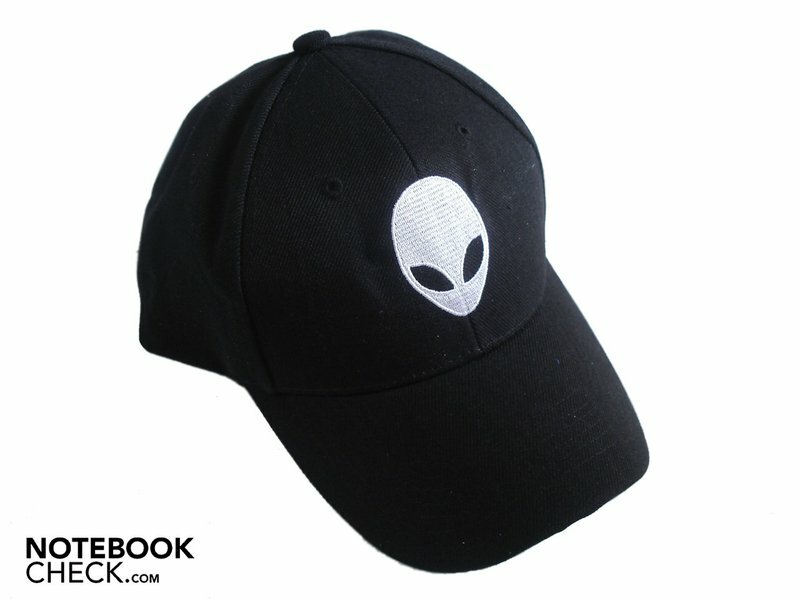 When you open the M17x's accessories box, you'll likely be amazed. 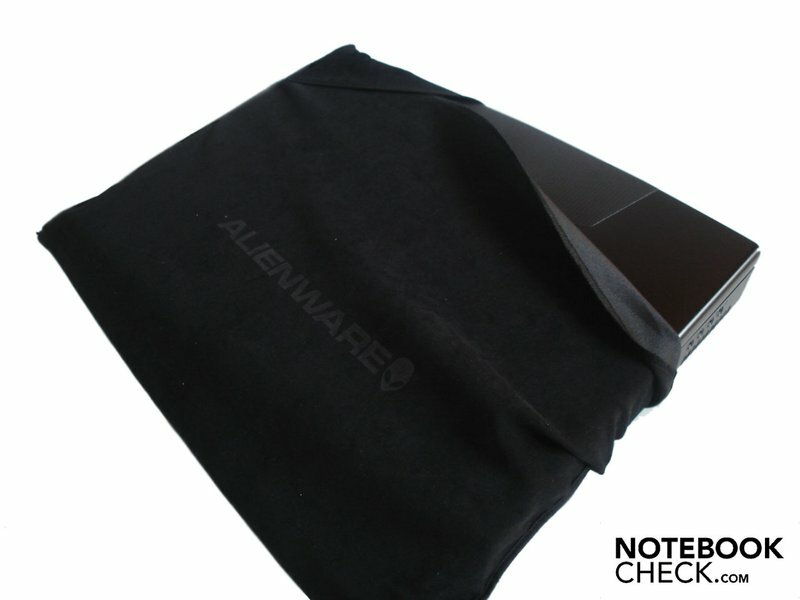 Aside from a black base cap, there is also a high-end mouse pad (both with the typical Alienware logo) that should satisfy even the high expectations of gamers. 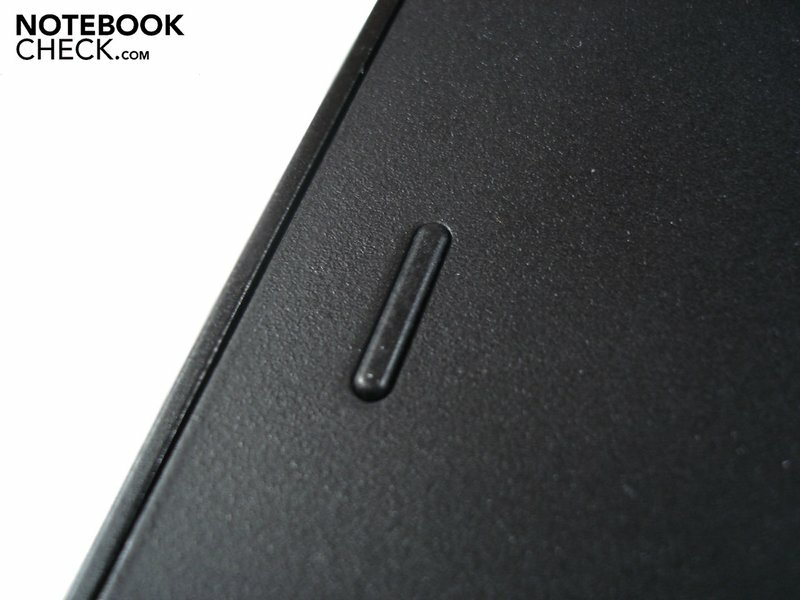 Besides that, the thick manual with a leather binding will provide for delighted gazes. 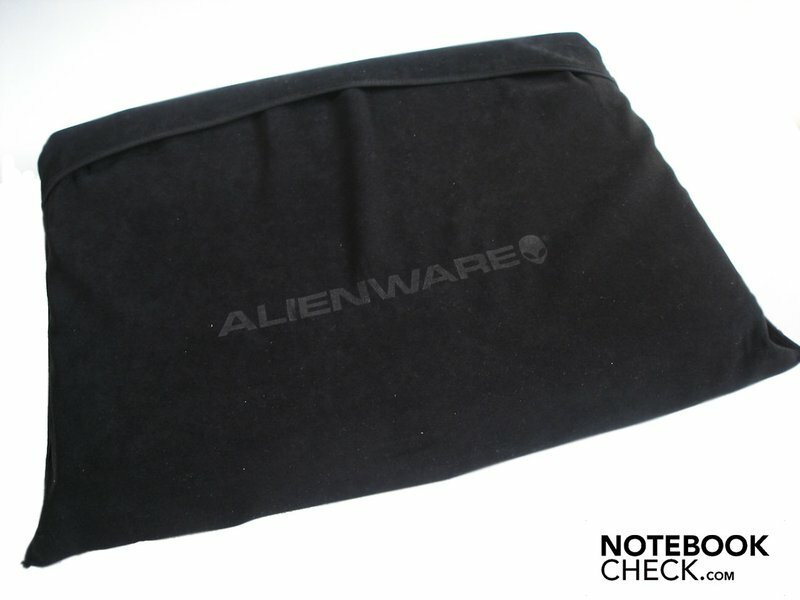 Finally, the notebook is covered by a black and very soft bag, which conceals the M17x from too curious eyes. By the way, the bag isn't really suitable for a safe transportation because it's not padded. 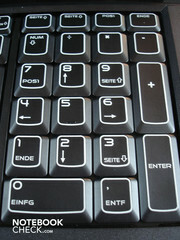 The built-in keyboard, which is beside a separate numerical block, has pleasantly large arrow keys and can convince in both pressure point and stroke length. 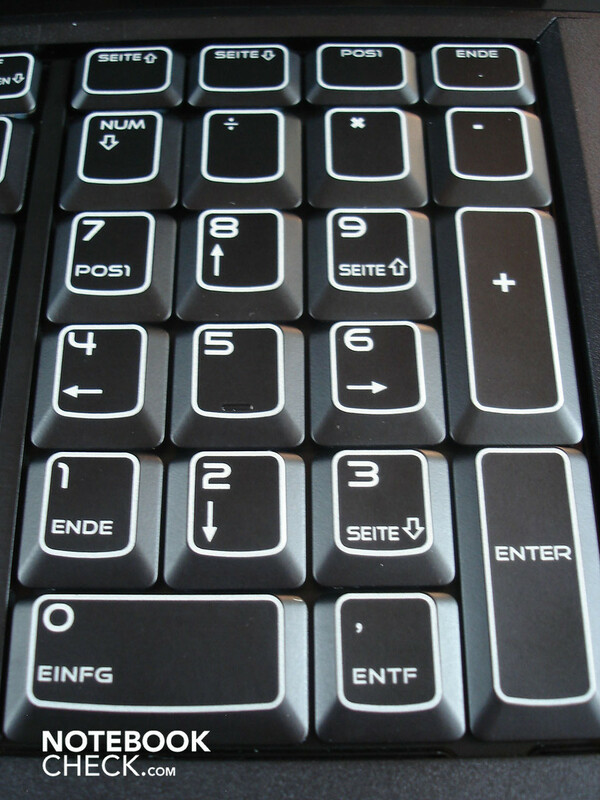 Unfortunately, the keyboard bends in the numerical block area and the enter key, as well as the arrow keys already yield notably under slight pressure. The key noise additionally proves to be quite clattery and therefore not exactly high-end. But you accommodate quickly, due to the excellent layout. 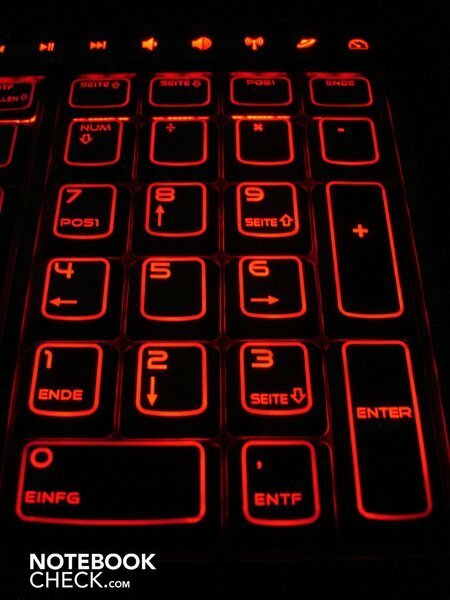 And the M17x's input devices are found very fast even in the darkest rooms because of the lighting. 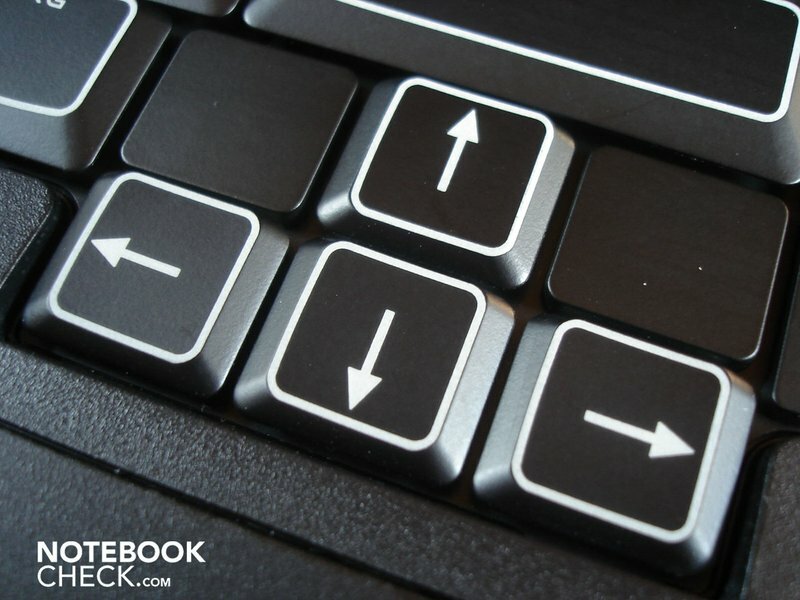 The somewhat too far left, but well-sized touchpad, gives good feedback due to its knobby structure but has to accept evident losses in gliding characteristics. Moreover, we aren't exactly satisfied with the precision: The mouse cursor generally moves quite jerkily. 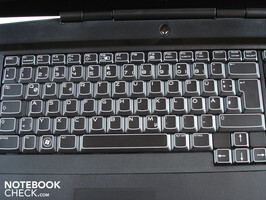 In return, we found the plain touchpad keys excellent. 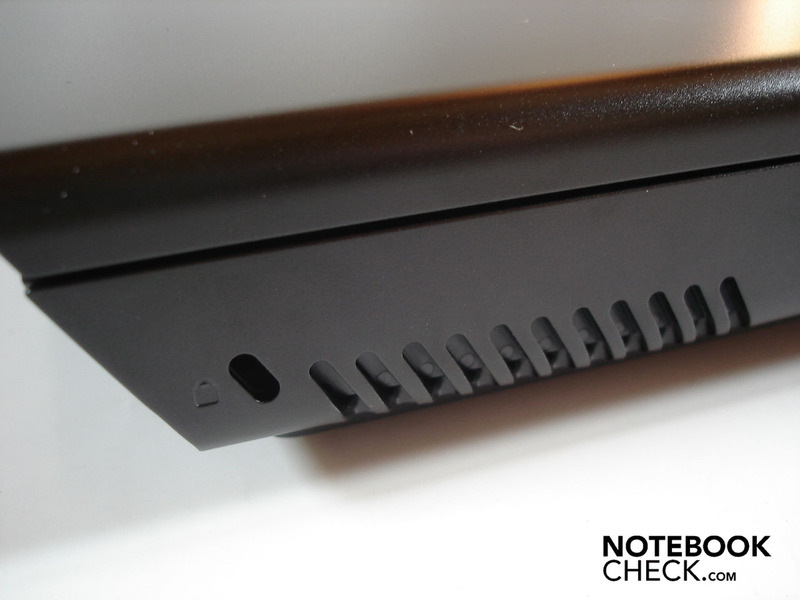 The stroke length is short, the pressure point crisp and the trigger noise pleasant. The built-in 17.0 inch Dual CCFL display has a 16:10 format and a resolution of 1920x1200 pixels and has an astonishingly high-end quality. Thus, all rates are more than impressive and in comparison to the M17x, the displays of other manufacturers rather look like a bad joke. The brightness is on a very high level with an average of 292 cd/m2. The display gleams over all measure due to this and may turn out to be a serious competitor for some external monitors. The contrast of 743:1 is equally very good; colors appear very vivid and natural. The black value of 0.4 cd/m2 makes sure that black really looks like black and doesn't drift off into gray. The illumination of 89% is also unusually good. You've probably already noticed, no matter if office, image editing, movies or games, the built-in screen always makes an excellent impression. 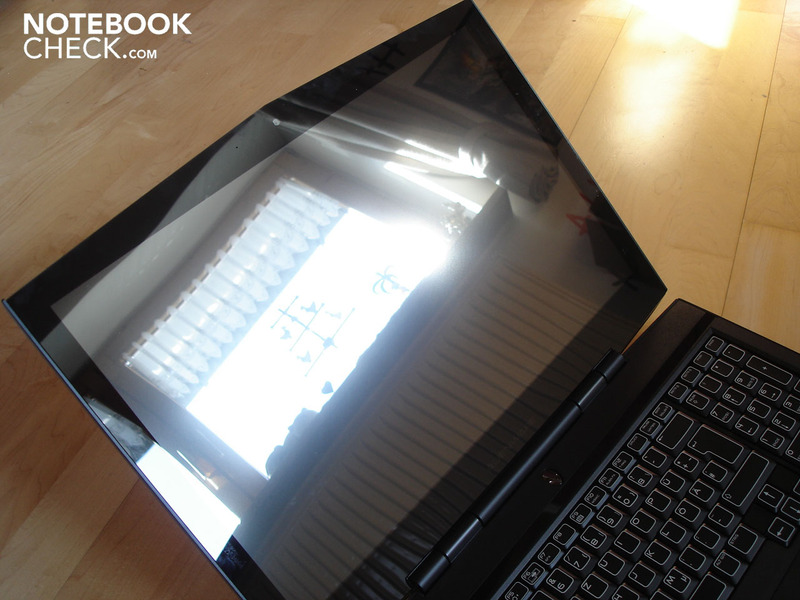 On the other side, the fact that Alienware hasn't forgone on a glossy coating isn't as excellent. Because of this kind of finish, the display is very sensitive on the one hand and, on the other, disagreeable reflections can turn up outdoors and even indoors. But because the display, as mentioned, has very good brightness rates, it doesn't have the same impact as it is the case in other notebooks. Furthermore, the viewing angles are amazingly wide and far better than the majority of its competitors. Barely any changes, such as color deviations or brightness differences, don't turn up even in wider angles on the horizontal plane. On the vertical plane, the viewing angles also stay fairly consistent. 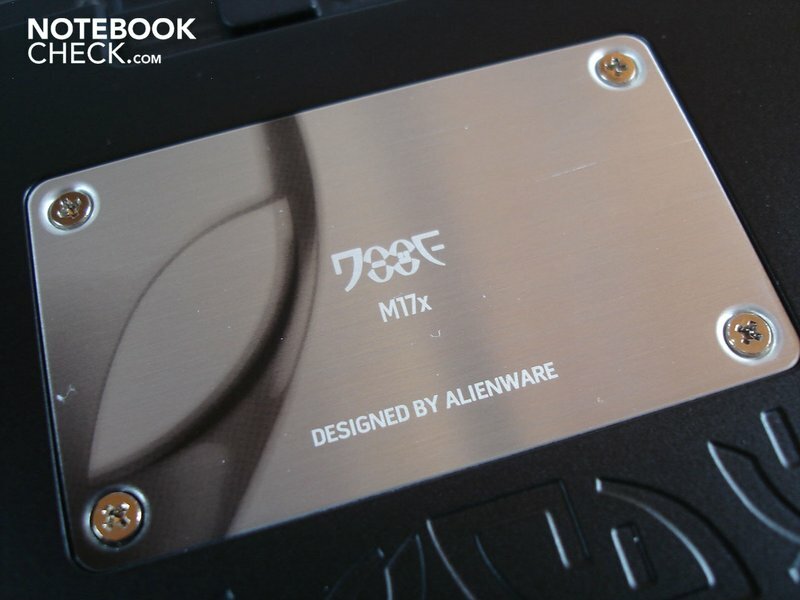 The M17x prototype provided to us has a Core i7-620M from Intel built-in as the processor. 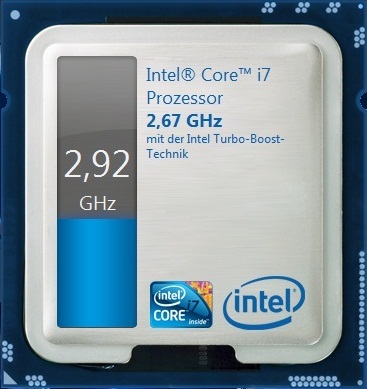 The 620M, different than most Core i7 models, has "only" two cores, but clocks with at least 2.66 GHz, whereas the standard clock rate of the quad-core models don't exceed 2.00 GHz. Just like the Core i5 range, the Core i7-620M also supports the practical turbo boost, which provides for an automatic overclocking of the CPU and goes up to an enormous 3.33 GHz in the 620M. Whilst we have formerly made the experience that there was barely any overclocking effect under load with the quad-core Core i7 models, the 620M proves to be far more clocking-eager. 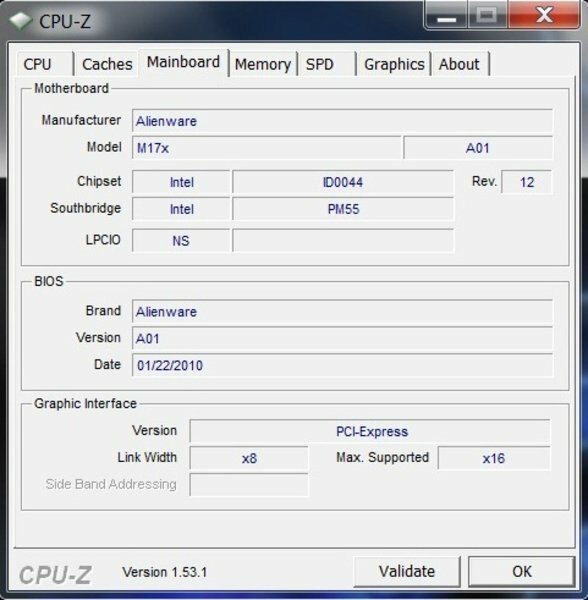 Thus, it even ran permanently with 2.79 to 2.92 GHz under full load (Prime + Furmark) according to Intel's Turbo Boost tool. However, it should be noted that Coretemp and CPUZ sometimes leave out other rates. 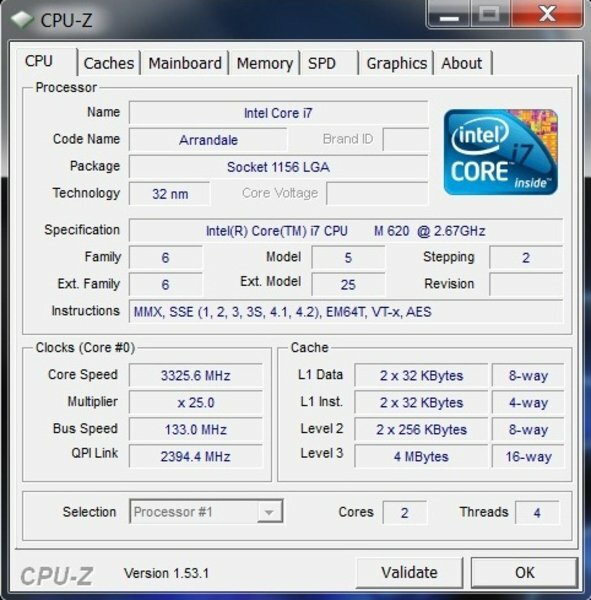 A further advantage of the Core i7-620M is the hyperthreading technology. It provides for two additional CPU cores being simulated, whereas currently mainly applications optimized for it have a benefit. An innovation since the Core 2 architecture is the so-called GMA HD, integrated graphic core, which is still manufactured in a 45nm structure width in opposition to the CPU (32nm). The Core i7-620M's power consumption is over average with 35 watts, but still not quite as high as in the quad-core models, which treat themselves up to 45 watts. The 620M's maximum operating temperature (Tjunction) is around a fairly high 105°C. Finally the dual-corer has a remarkable 4 MByte L3 cache beside a 512 KByte L2 cache. Alienware has put a four GByte fast DDR3 RAM into the M17x, in order to not slow the processor down. Agreeably, the entire capacity is even available in practice because of the 64 bit operating system. 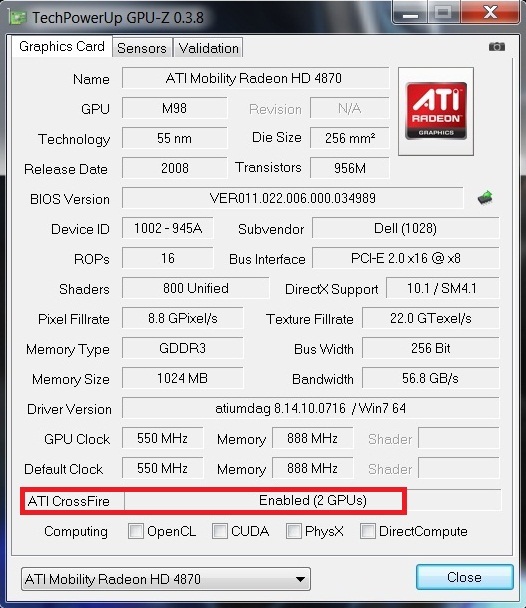 The built-in graphic card combination of two Mobility Radeon HD 4870s from ATI, which run in a Crossfire array (also called HD 4870 X2), is a real whopper. The HD 4870 is only capable of DirectX 10.1 and is already a somewhat aged high-end card. However, it doesn't have to hide from the newer, and in the meantime, DirectX 11 capable competitors in view of its specs. As the HD 5870, the HD 4870 can fall back on lavish 800 unified shaders. 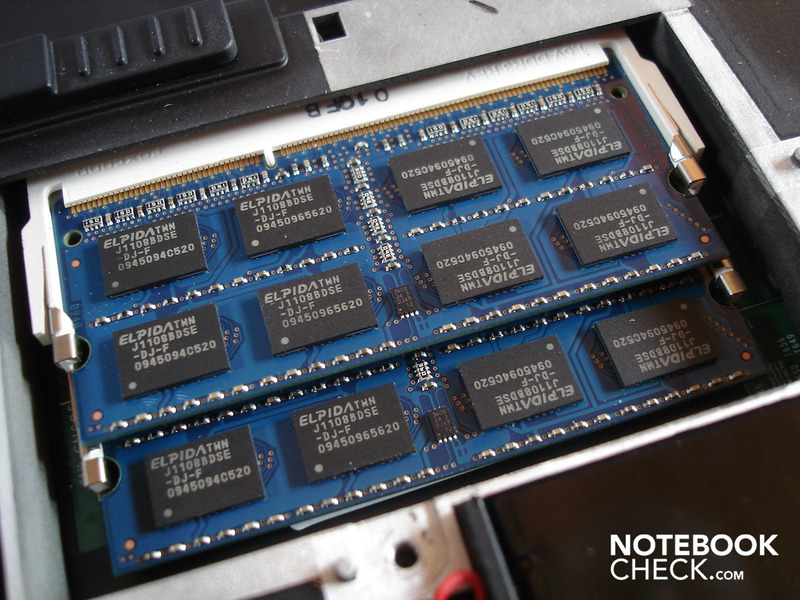 The clock rate of 550 MHz (core) and 888 MHz (memory) is somewhat lower than in the HD 5870 with 700 MHz (core) and 1000 MHz (memory), but the HD 4870 can serve with a 256 bit wide memory interface, whilst the HD 5870 has to be content with a 128 bit memory band width. The HD 4870's GDDR5 VRAM has a total capacity of 1024 MBytes. The power consumption of 65 watts is very similar to the HD 5870. In return, the manufacturing process of 55nm looks a bit antiquated (HD 5870: 40nm). 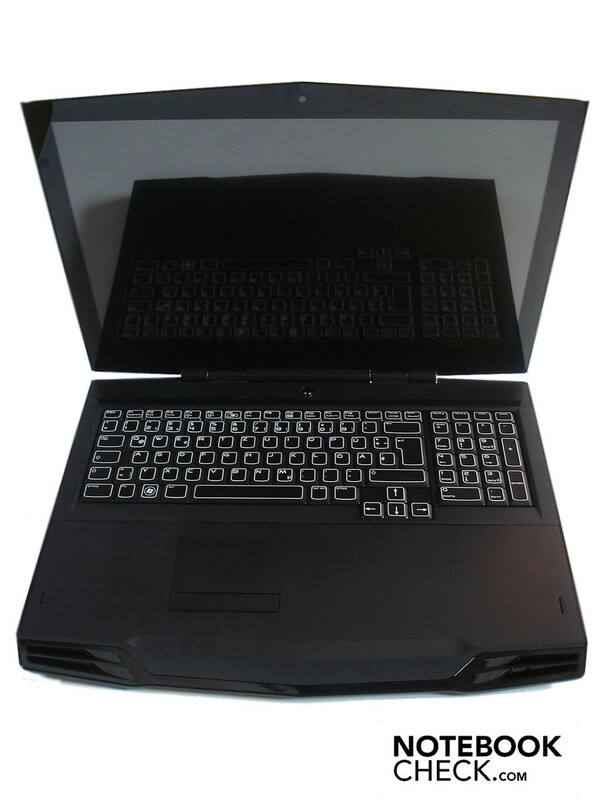 A feature of the HD 4870 worth mentioning is the UVD2 technology, with which the CPU can be unloaded when computing HD material. It's time to take a closer look at the advantages and disadvantages of Crossfire/SLI systems, such as the HD 4870 X2. Of course, a theoretical performance almost twice high as in comparison to a single chip is on the pro side. Basically, that already was all the advantages. In opposition to that, the list of disadvantages turns out significantly longer. 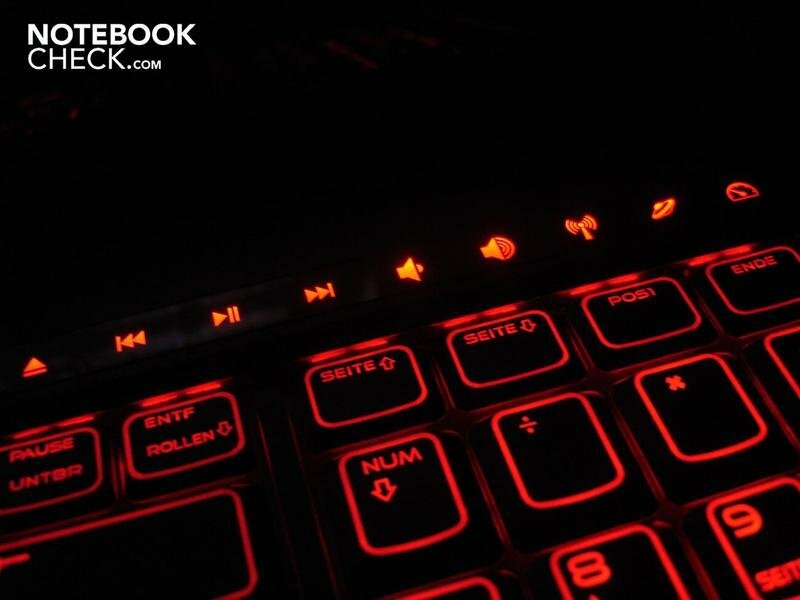 Thus, not only the power consumption is twice as high with two graphic cards (because of which the battery life logically sinks), but it also results in a higher temperature and therefore usually a higher noise development. Above that, Crossfire/SLI systems are naturally not exactly cheap in procurement and very driver and gaming specific. The main critique point of the Crossfire/SLI is the phenomenon of so-called micro-stuttering. Every single picture is computed by a graphic card alternately in the currently used Crossfire/SLI technology Subjectively evident stuttering turns up especially in an field below 35 fps because the intervals between each picture can vary in length. The image looks significantly more smooth and homogeneous with a single graphic card in this case. Example: If the HD 4870 X2 runs with 25 fps in game xyz and the HD 4870, in opposition, with only 20 fps, the performance looks better on the latter anyway. Independent of that, Crossfire can be enabled or disabled without difficulty in the Catalyst Control Center (see screenshot above). This procedure takes about 10 seconds and always works perfectly. We've put the Core i7-620M's application performance to its paces with Cinebench R10. 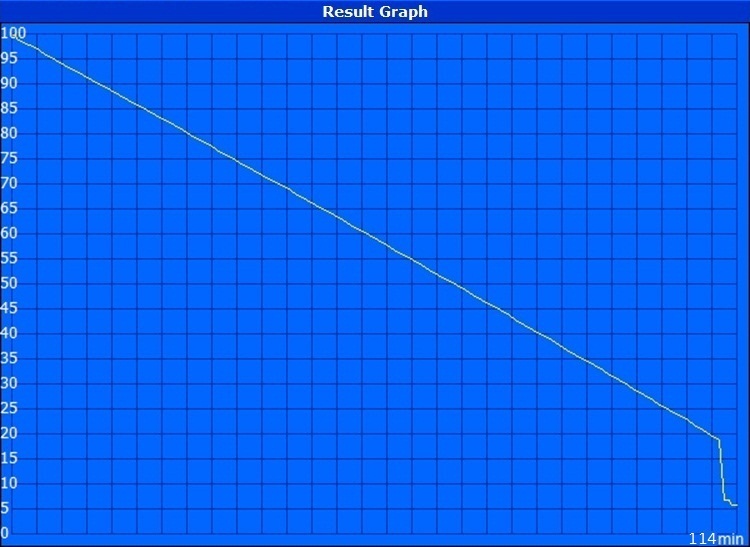 You can see the results with enabled Crossfire below. The rates without Crossfire are only slightly higher (probably due to the more uncomplicated administration effort). Thus, 4186 points in the single-core and 9245 points in the multi-core rendering of the faster 64 bit instance of Cinebench are achieved. Intel's popular quad-corer Core i7-720QM is with 3690 points, unsurprisingly, a bit slower in single-core rendering because of the lower clock rate. In return, in multi-core rendering it's superior by almost 1000 points with 10078 points. 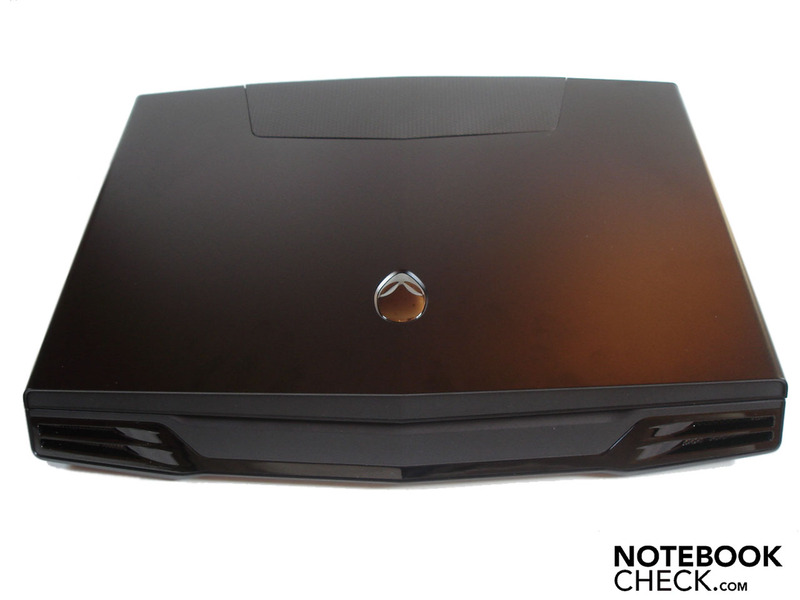 The Alienware M17x reaches an enormous 10598 points in PCMark Vantage, not least thanks to the Radeon HD 4870 X2, and is the highest rate we've ever measured. The comparison to the competitor, GeForce GTX 280M, and its SLI counterpart in the graphic-biased 3DMarks is especially interesting. To make it short: A single Radeon HD 4870 is in both 3DMark05 (-300 points), as well as in 3DMark06 (-1350 points) slower than a GTX 280M, but has a slight advantage over it in 3DMark Vantage (+300 points). A Radeon HD 4870 X2 leaves the GeForce GTX 280M SLI behind in all three benchmarks. It is a difference of about 2400 points in 3DMark05, about 100 points in 3DMark06 and around 1000 points in 3DMark Vantage for the HD 4870 X2. 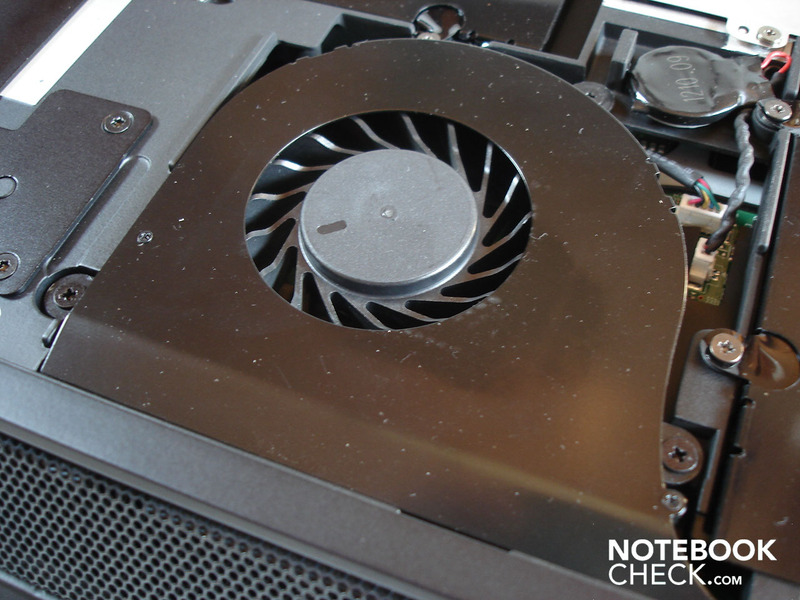 Generally, the GeForce GTX is slightly superior to the HD 4870 in the synthetical benchmarks. In opposition, the HD 4870 X2 can distinguish itself evidently from the GeForce GTX 280M SLI. 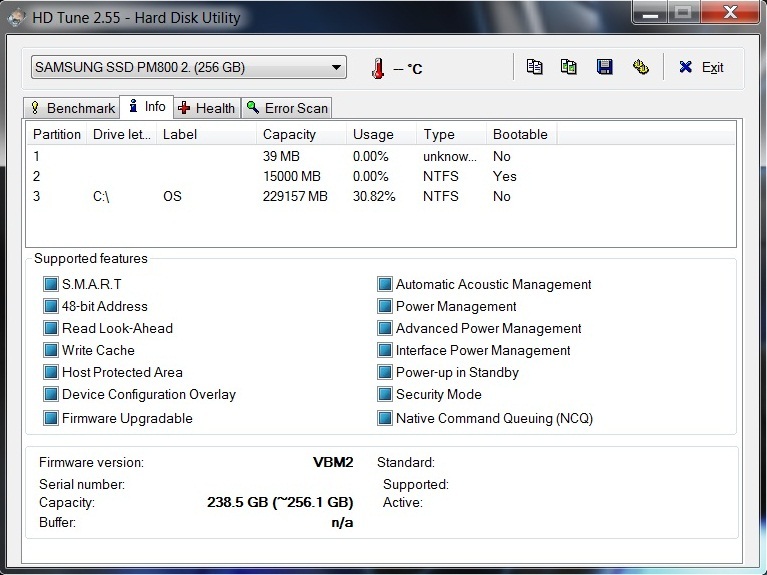 Alienware has surprised us with a SSD from Samsung as the hard disk, which actually can't be configured at the moment. 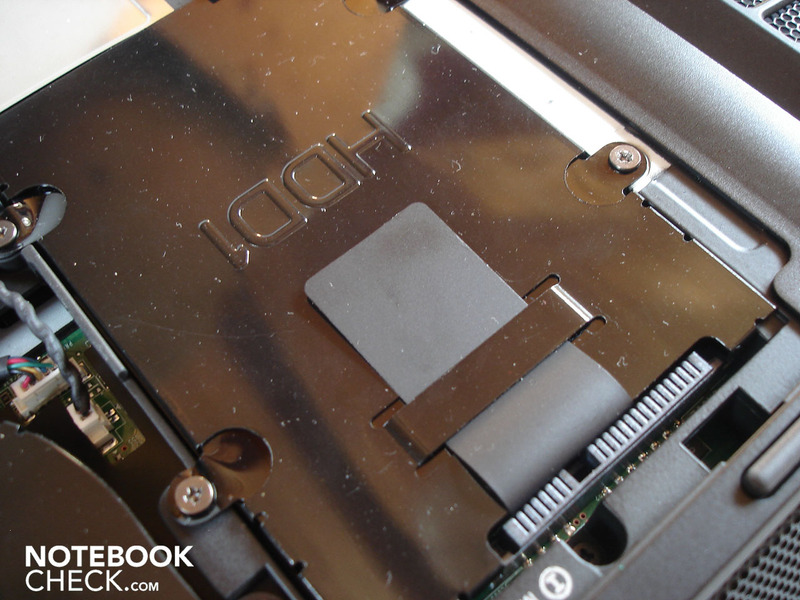 We were pleased about it anyway, because the SSD shows a very good performance. This becomes evident by the HD Tune tool. According to HD Tune, the average transfer rate is supposed to be 148.7 MB/s, which is 2-3 times as much as a "normal" hard disk. The throughput rate is also about twice as high with 126.5 MB/s. The biggest difference between a HDD and SSD becomes evident in the access rate. 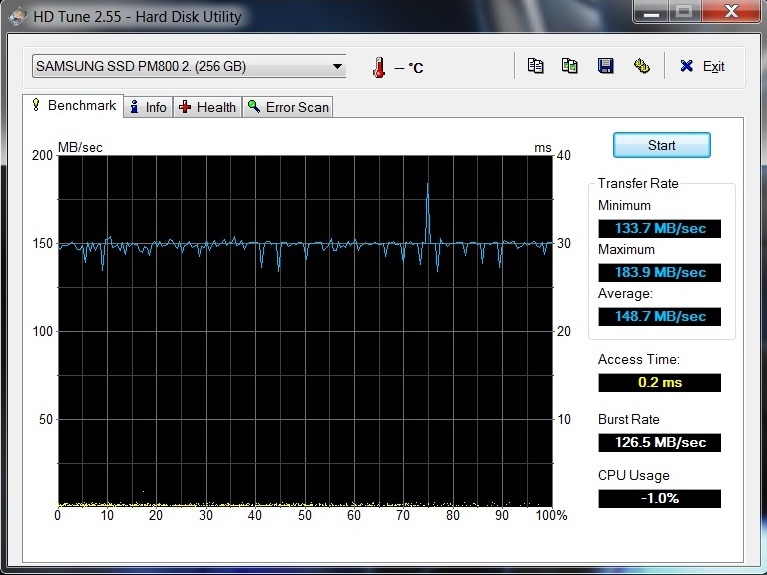 Whilst a HDD usually achieves between 10 and 20 ms, the built-in SSD achieves 0.2 ms! The booting time and loading process (e.g. in games) is subjectively a lot shorter than with HDDs to a part, and the operating system generally responds very fast. The SSD again attracts attention in the Windows 7 performance index with a high 7.1 points. Most HDDs don't even surpass 6.0 points. However, the Core i7-620M has been rated a bit lower with 6.9 points, the Radeon HD 4870 X2, contrarily, a bit higher with 7.2 points. The RAM represents the taillight, as it could only score 5.9 points despite its high clock rate. If the latencies of a system are too high, it can come to problems when external devices are connected, e.g. sound crackling with sound cards. Usually, the reason is found in device drivers, which have to be identified and isolated. This can be confidently omitted in the M17x because the latencies never surpass the uncritical field of under 1000µs. 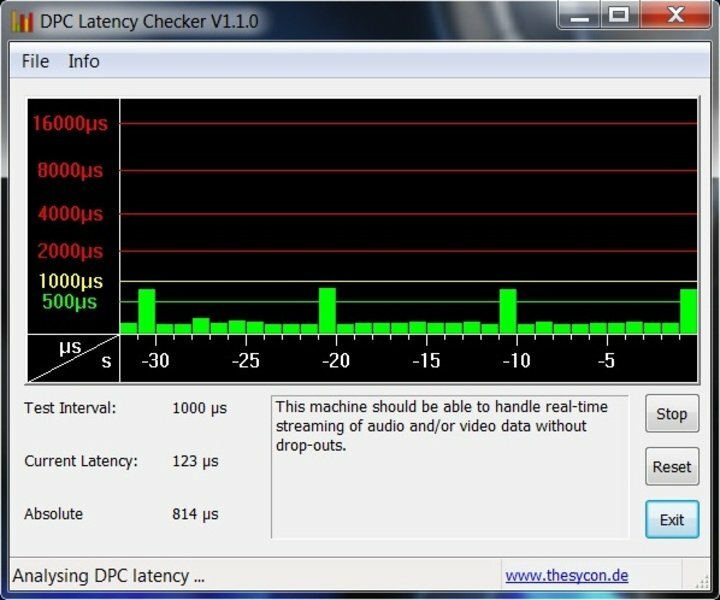 However, if you do have latency problem, this may be a remedy. 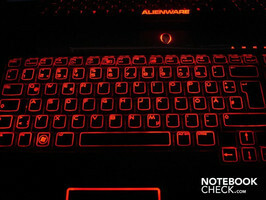 The Alienware M17x's application performance is awesome. We've almost never had such an efficient system in review. No matter if processor, graphic card or hard disk, the existing reference rates were always achieved, if not even surpassed. 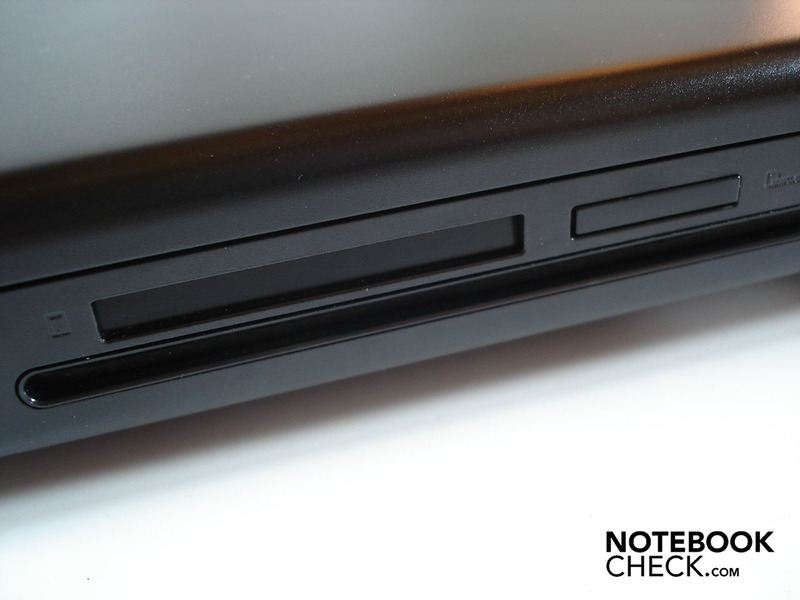 Moreover, the M17x is one of the few notebooks that can, to an extent, keep up with powerful desktop systems. Already a single HD 4870 can provide for a very good refresh rate of 88.8 fps in a resolution of 1280x1024, maximum details and 4x AA in the horror shooter, F.E.A.R. 2. The GeForce is roughly on the same level in the same settings with 87 fps. 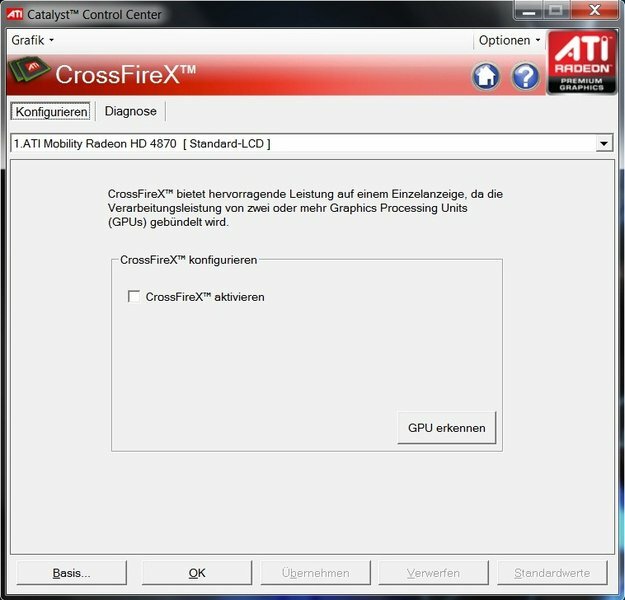 If Crossfire is enabled, the performance increases slightly and reaches 105.3 fps. The GeForce GTX 280M SLI is, however, even faster with 120 fps. Even a single HD 4870 still produces smooth refresh rates of 49.3 fps in a resolution of 1920x1080 (again with maximum details and 4x AA). 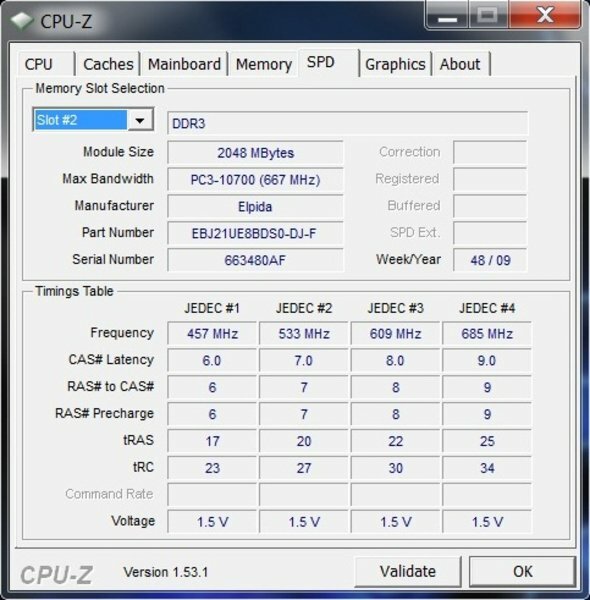 But if the second HD 4870 is enabled, the performance is duplicated to almost 92.5 fps. According to first reviews, Modern Warfare 2 has found a serious competitor in Battlefield Bad Company 2, at least in multiplayer. However, you have to take the HD 4870 X2's performance seriously, as it conjures a very smooth 59.2 fps onto the screen in a resolution of 1920x1080, very high details and 4x AA. 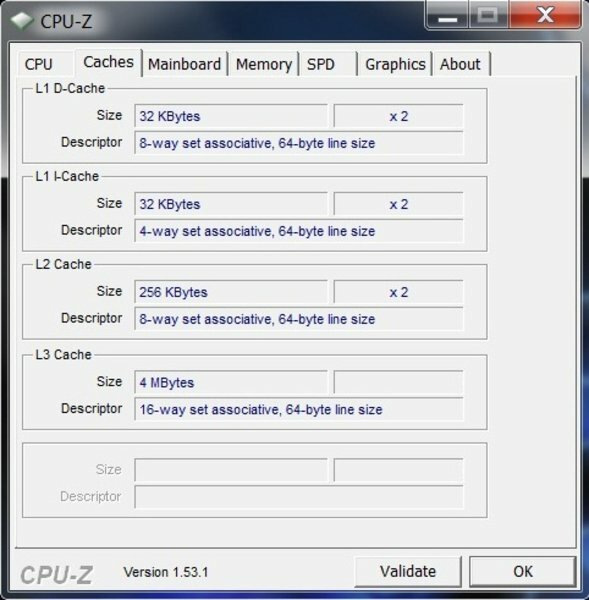 The performance is cut in half to a slightly jerky 30.8 fps when Crossfire is disabled. The add-on, Venice, is currently scooping the market again with dream rates. And the HD 4870 X2's performance in the main game can also be described a dream. Whilst a single HD 4670 is actually fully sufficient with 58.8 fps in a resolution of 1280x1024, very high details, and 4x AF (GeForce GTS 280M: 48.0 fps), the HD 4870 X2 can distinguish itself again with a recorded 89.8 fps. The single HD 4870 responds to an increase of resolution to 1920x1080 with a loss of a moderate 10 fps with 48.2 fps. However, the Crossfire provides for a respectable performance boost with 75.5 fps. The atmospheric role game from Germany develops to a right down stutter party in many notebooks. Even the HD 4879 has its problems with high resolutions and details setting without Crossfire. Where a single HD 4870 only reaches an average 28.3 fps in a resolution of 1920x1080, high details and 4x AF, it's a higher, but due to the mentioned micro-stutters, subjectively slower 31.6 fps with the HD 4870 X2. Both rates are still just alright for gaming, but for a really smooth experience either the details or the resolution has to be reduced. Just how insufficiently the engine of the newest Need for Speed episode actually has been optimized becomes apparent with high-end cards. Opponents, like Dirt 2, look a lot prettier on the one side and on the other, also run significantly smoother. Thus, even the very fast HD 4870 has problems and only reaches 30.7 fps in a resolution of 1920x1080, high details and 4xAA. Enabling Crossfire stirs up disbelief because the performance even sinks to a meager 25 fps. Above that, the whole thing practically felt more like 15 fps because of the micro stutters. Because Shift apparently can't benefit from Crossfire (rather the opposite), you should leave it disabled right from the start. In return, the beautifully staged Colin McRae Dirt 2 feels a lot more comfortable with enabled Crossfire. You can race over the chic and challenging laps perfectly with 50.4 fps in the FullHD resolution, very high details, and 4x AA. However, you lose a lot of performance without Crossfire. 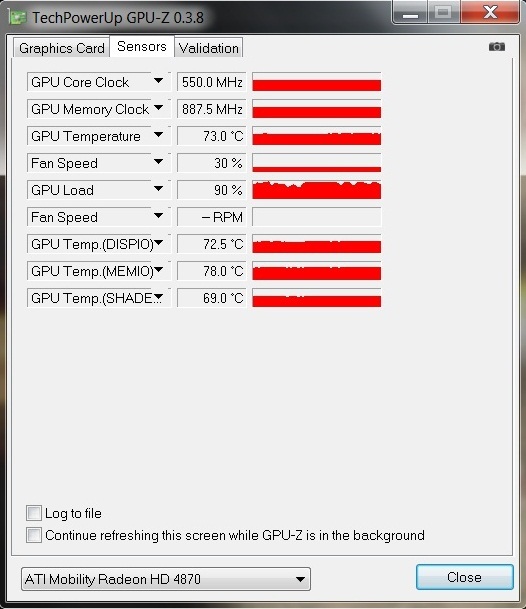 A single Radeon HD 4870 only achieves a still adequate 29.5 fps. Crysis has been one of the prettiest and technically challenging tracks for years. The wheat is usually separated from the chaff here. The performance of a single HD 4870 is impressive with 50.0 fps in a GPU runthrough in a resolution of 1024x768 and high details. A GTX 280M is about 5 fps slower and achieves 45 fps. The average refresh rate increases only marginally with enabled Crossfire and achieves 52.4 fps. The GTX 280M SLI isn't any faster with 53.0, either. The HD 4870 has to admit defeat with 24.8 fps in a resolution of 1920x1080 and high details, and must so leave the battlefield disappointed. The HD 4870 X2, however, earns respect with 42.9 fps. 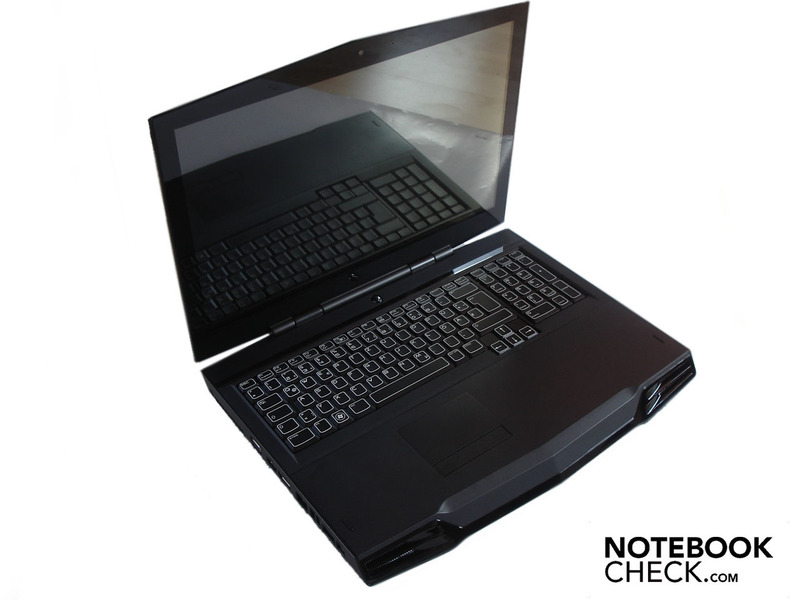 Thus, the Alienware M17x with the HD 4870 X2 is one of the few notebooks that can present Crysis smoothly in a FullHD resolution with high details. 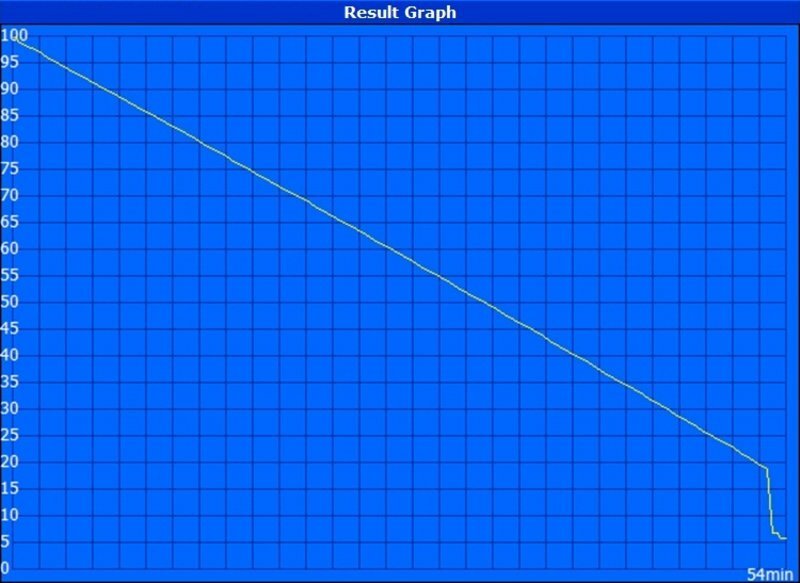 Note: We often had to struggle with graphic errors in the integrated benchmark of Crysis, especially with enabled Crossfire (flickering textures, vegetation disappearing for a short time), which could only be remedied by a restart. Additionally, even a blue screen was recorded (atikmdag.sys = graphic driver). Because we only use the demo and not the leased full version, the reason for that doesn't necessarily have to be the graphic card or its drivers. There were single graphic errors at the start of a game and during loading (e.g. flickering mouse cursor) in other tracks, again mainly with enabled Crossfire). However, no problems turned up during games, with exception of Crysis. 1) A single Radeon HD 4870 is already usually strong enough to present the latest games quite smoothly in a FullHD resolution, including high details and often even including quality enhancements, like antialiasing or anisotropic filtering. 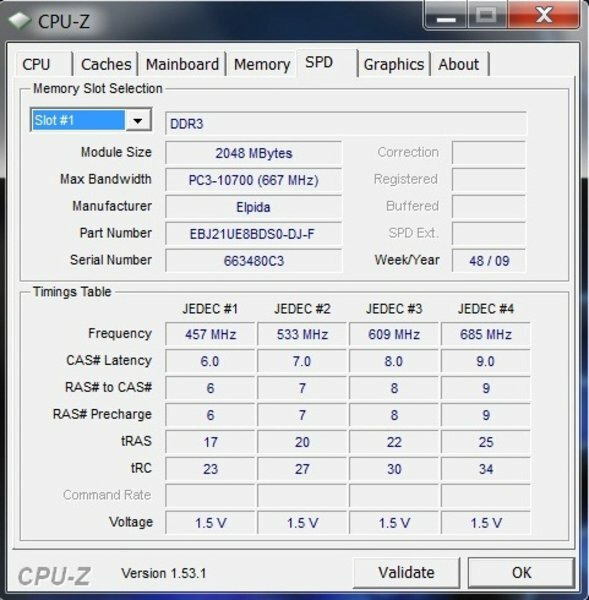 2) The Radeon HD 4870 slightly beats the GeForce GTX 280M (at least in our benchmarks) by an average of 60.4 to 56.3 fps. 3) The Crossfire HD 4870 provides for a total performance boost of about 57% in high resolutions (1920x1080), whereas the advantages turned out as follows for the single games: Crysis (GPU) +73%, Crysis (CPU +81%, F.E.A.R. 2 +88%, Anno 1404 +57%, Modern Warfare +93%, Risen +12% and Dirt 2 + 71%. 4) The Radeon 4870 X2 defeats the GeForce GTX 280M SLI with 74.9 to 64.4 fps (in the benchmarks used in our tests). 5) Crossfire works in practice astonishingly smooth, reliable and stable, except for the mentioned single graphic errors. 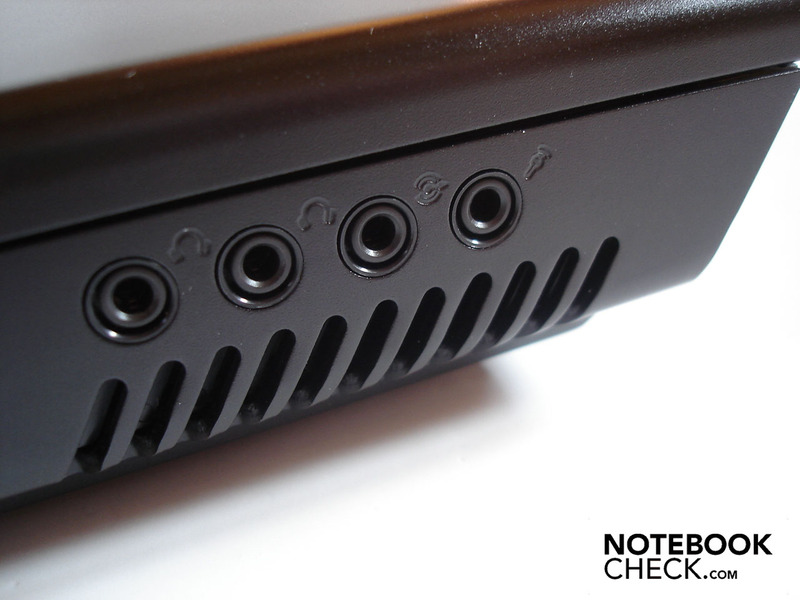 6) The mysterious micro-stutters are partly very evident and frequently do curtail the gaming fun. When in doubt, Crossfire shouldn't be used at all when refresh rates are low. 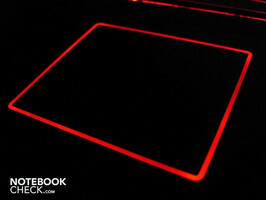 Note: We will soon review the HellMachine SLI from Deviltech. There, we will put a GeForce GTX 285M SLI hook up to the test and then compare the performance accordingly with the Radeon HD 4870 X2. The M17x's performance might be great in the configuration at hand, but a negative side effect is the intensive noise development. Thus, the fans turn up to a very audible 41.1 dB(A) immediately under load. A short time later, the fans change up a further gear and the M17x howls along with up to 52.2 dB(A) almost unbearably loud. You can almost imagine you're sitting beside a blow dryer when you close eyes. Additionally, a not closer identified component often attracted attention with strange, nerve-shattering and high pitched whistling noises. Hopefully, it's an one-off peculiarity in the case of our prototype. The DVD drive almost equals the fans with 43.3 dB(A) during DVD rendering. Side note: In rare cases, the picture stutters during DVD rendering. Moreover, the drive sometimes rattles disagreeably at data accessing. Basically, the M17x is thus only suitable for very noise resistant natures. 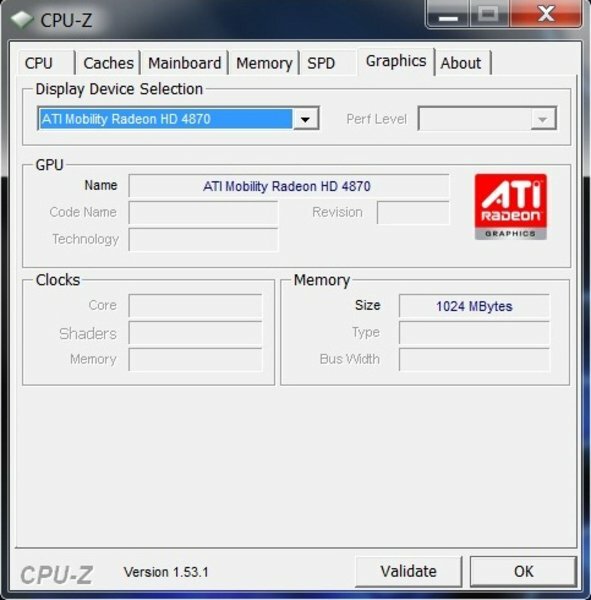 The noise development can turn out to be a lot lower with only one built-in Radeon HD 4870. If the system noise can't convince, at least the temperatures can. Both the bottom, with a maximum of 27.1°C, as well as the upper side, with a maximum of 29.9°C, stay pleasantly cool in idle mode. The temperatures are especially increased in the back side areas because the fans are harbored here. But, 40.0°C isn't exceeded. 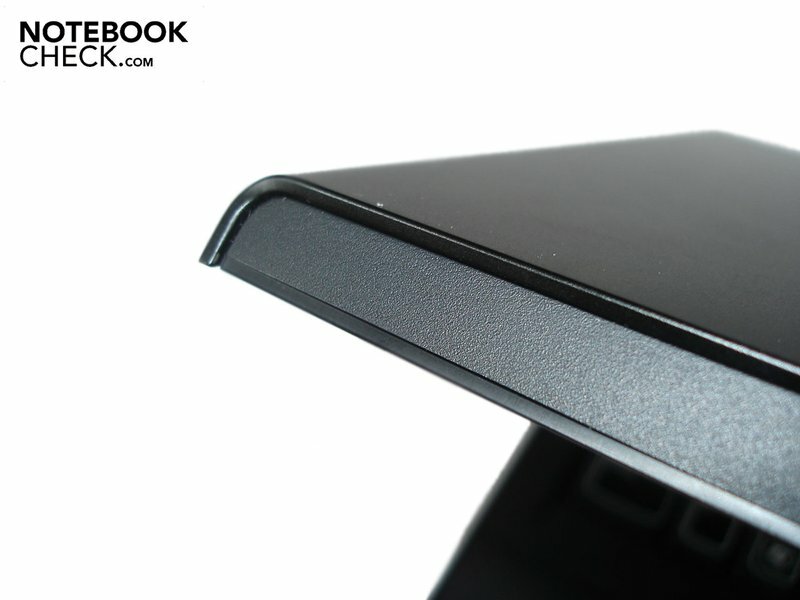 The wrist-rest stays in a pleasant field with a maximum of 25.3°C, even under load. 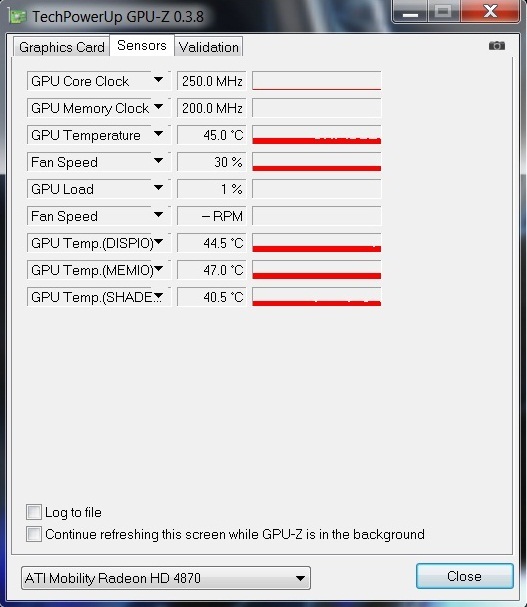 A look into the case: The temperature(s) of the graphic card(s) also give(s) no reason for complaint. 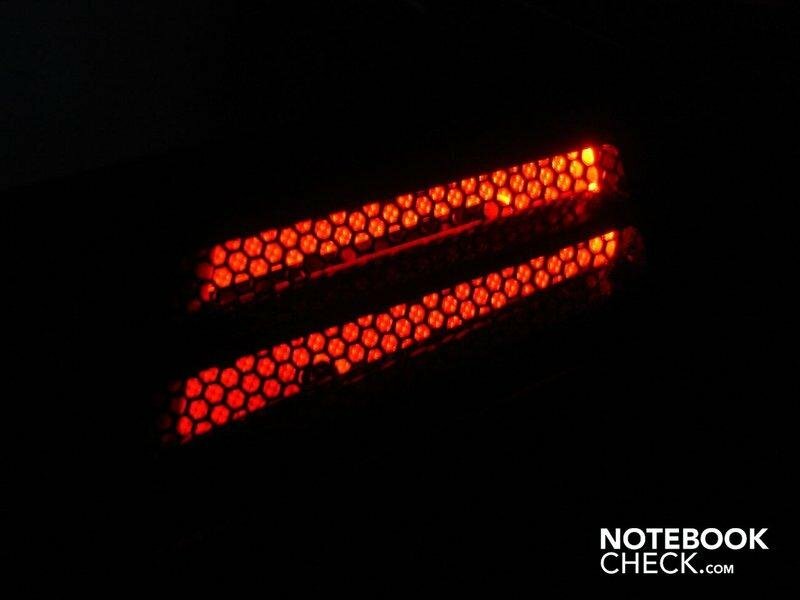 The HD 4770 has about 45°C in idle mode and a completely reasonable 73°C under load. 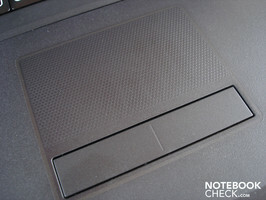 (+) The average temperature of the palmrest area of similar devices was 28.7 °C / 83.7 F (+3.4 °C / 6.2 F). 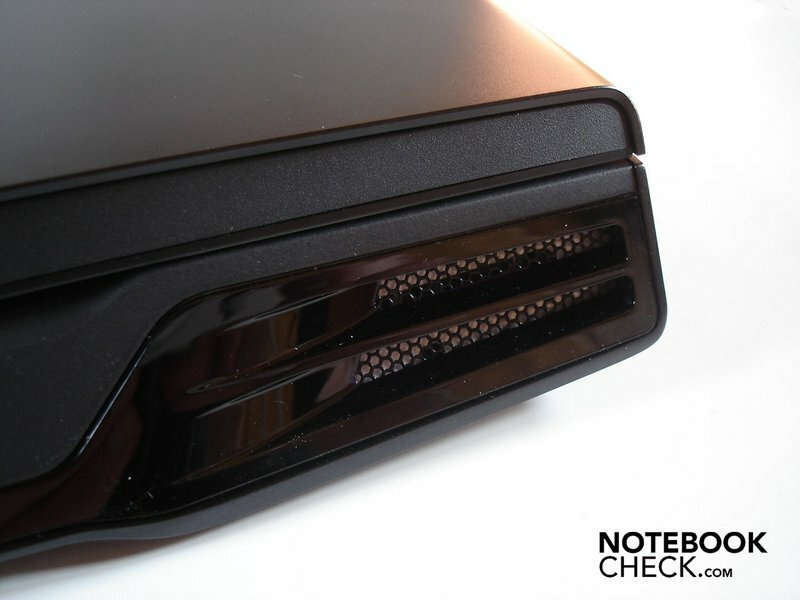 Good sound systems are scarce in notebooks. 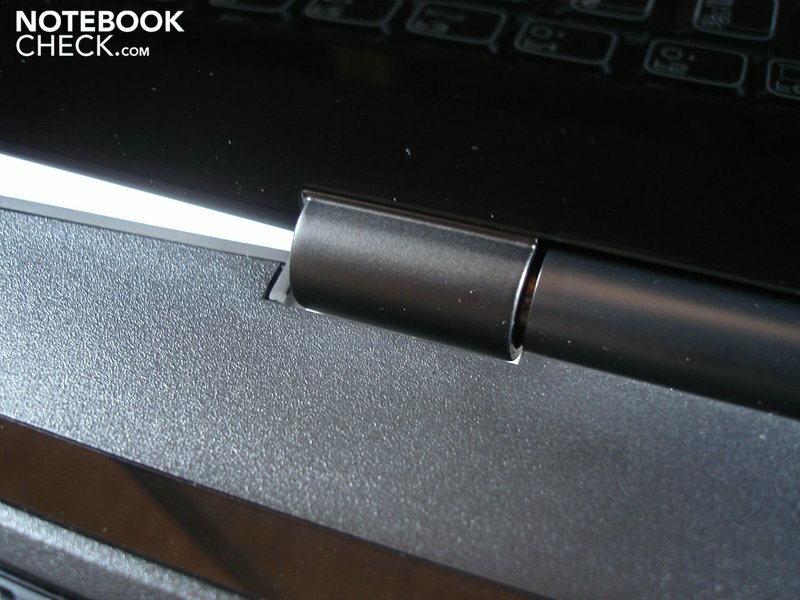 There are only a few exceptions, like the Aspire 8940G/8942G from Acer or the 500 range from Toshiba, which can spoil the user with a halfway reasonable sound. 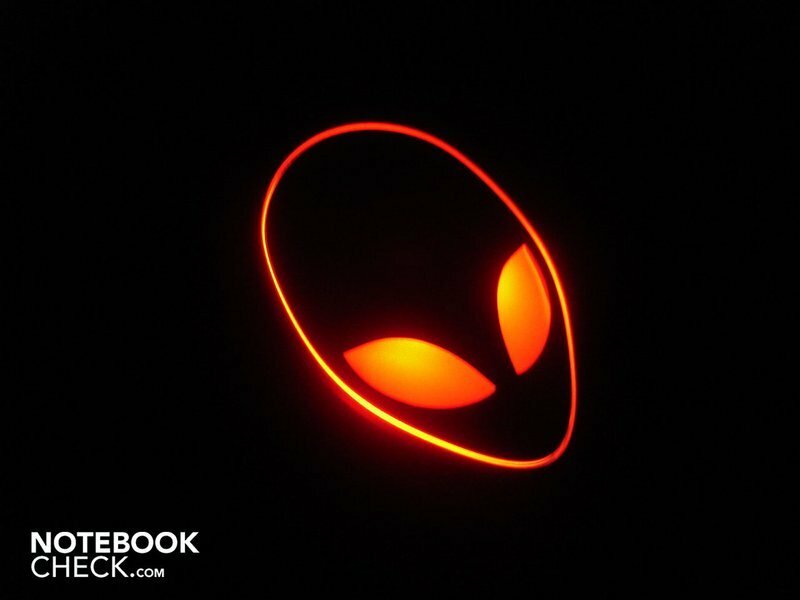 Alienware has fortunately built a strong sound system into the M17x, which doesn't have to hide from the mentioned examples. The various pitches are fairly well balanced and make a homogeneous impression. 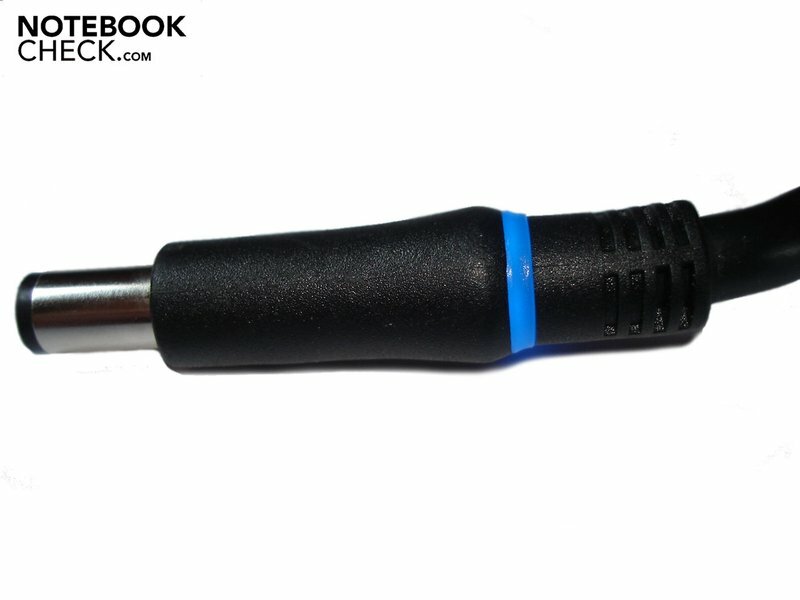 The maximum volume is convincing and the sound is generally presented as quite clear and precise. A typical fraying barely shows up even in full volume. At the same time, a bass is slightly audible, even if it does seem weak, meaning it lacks volume and animation. Without considering this, a marginal surround sound is created although the sound only comes to the fore when you listen closer. Of course, the M17x can't compete with a good external sound system, but the given sound is sufficient for various gaming and movie sessions, anyway. 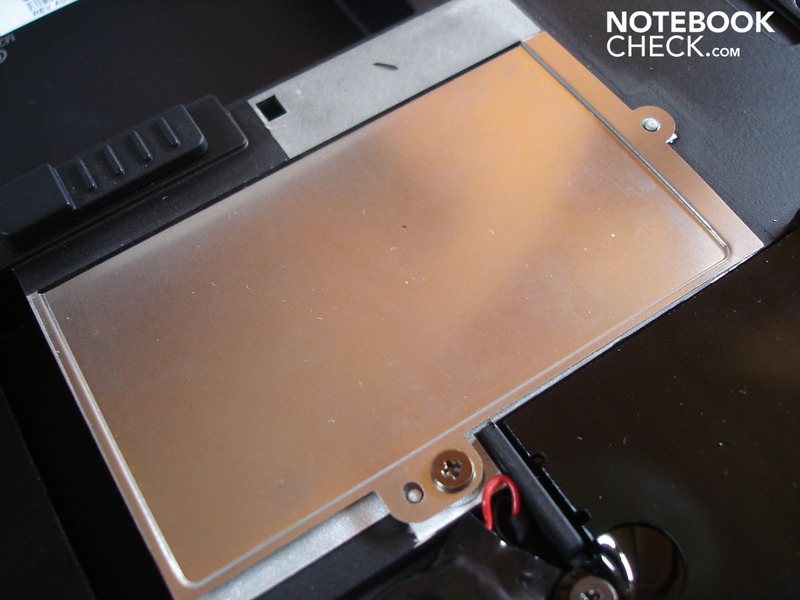 Evaluating the battery life proved to be unexpectedly difficult because in 95% of the case, the M17x froze when it was separated from the included adapter and could only be talked into working again with a restart. But when the 9 cell battery (85 Wh) worked, it could only satisfy the energy requirements of the power hungry components insufficiently. Thus, the M17x is already exhausted after 54 minutes under load (BatteryEater Classic test) with maximum brightness and disabled energy savings options. It doesn't look much better at DVD rendering with moderate energy savings options and disabled Crossfire, with 1 hour and 13 minutes. The M17x turns itself off after 1 hour and 26 minutes of internet surfing. Only with minimum brightness, full energy savings options and low load (Battery Eater Reader's test) does the runtime come close to the two hour mark with 1 hour and 54 minutes. 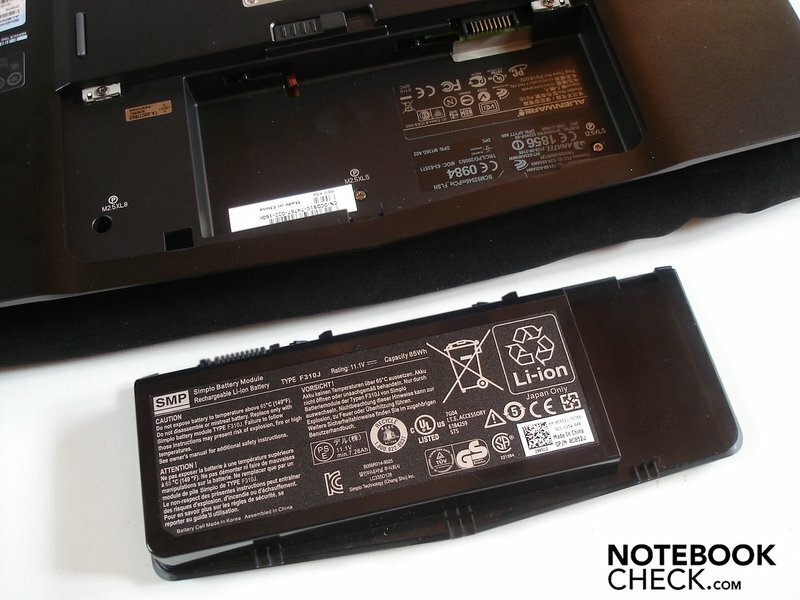 Thus, the battery isn't really suitable for longer trips, it needs a stationary use instead. 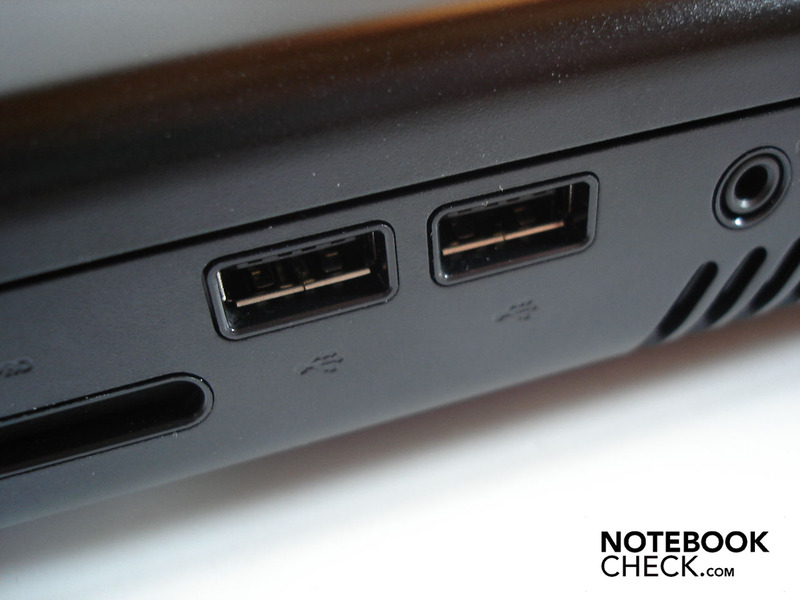 Incidentally, we could bypass the "freeze" problem by starting the notebook without the adapter to start with. Update: It's probably a software problem. After we set the system to a previous restore point, everything worked perfectly again. It's not really surprising that the energy requirement achieve astronomical heights for notebook conditions with such powerful components. The M17x drains up to 183.9 watts from the mains under load. The components treat themselves to between 52.1 and 69.5 watts in idle mode. 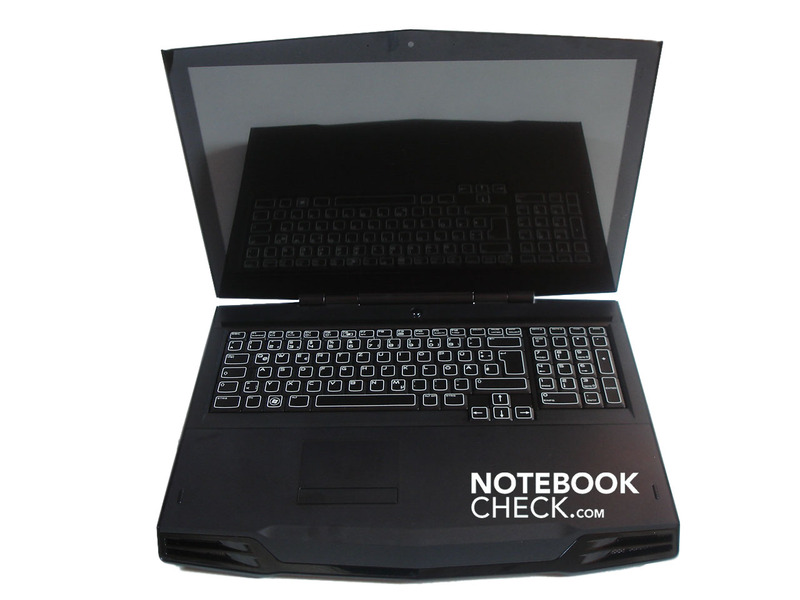 Various multimedia notebooks need that much under load. 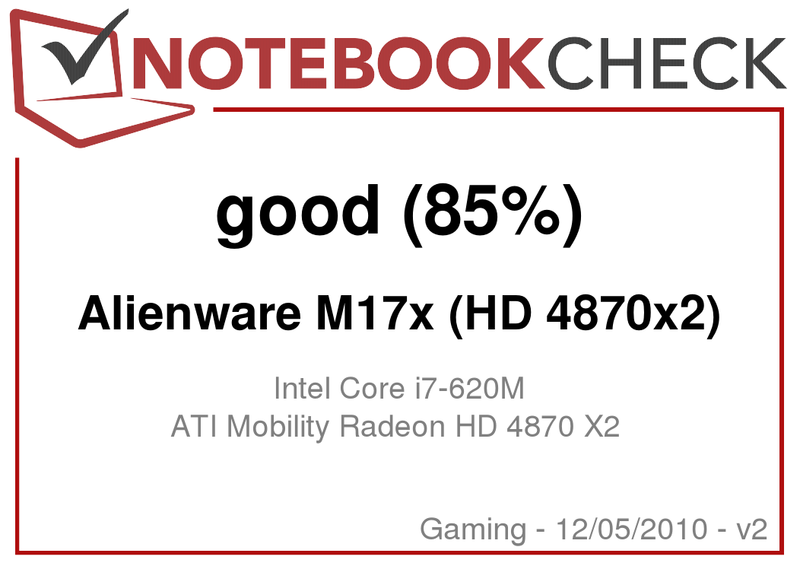 We had a hard time rating the M17x impartially. 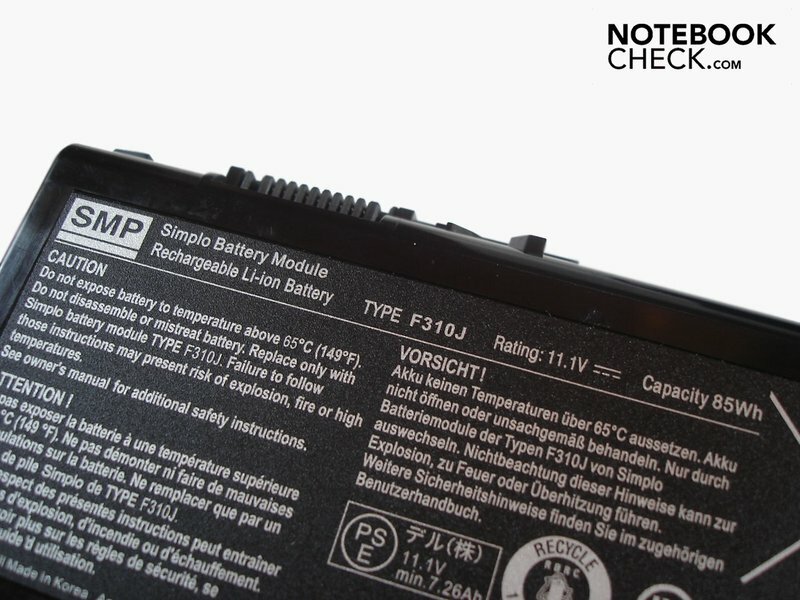 On the one side, the great weight, the especially under load very loud noise level and the numerous smaller and bigger flaws and errors, such as crashes in battery mode or single graphic errors in Crossfire are annoying. On the other side, the M17x proves to be worthy of reference in almost all other fields. The performance is awesome, due to the upclocked Core i7-620M and the very fast Radeon HD 4870 X2. At the same time, the M17x always stays astonishingly cool. 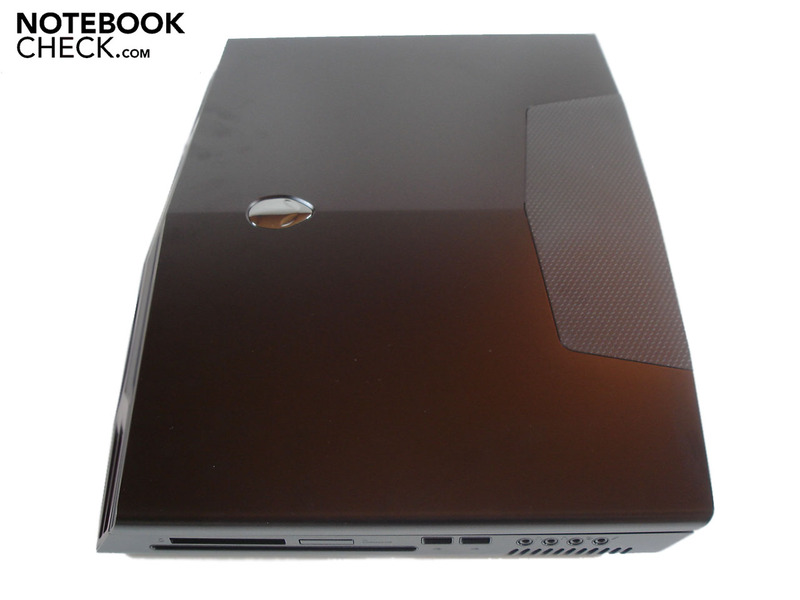 Moreover, the very stable aluminum case has an excellent workmanship and serves with an outstanding design. 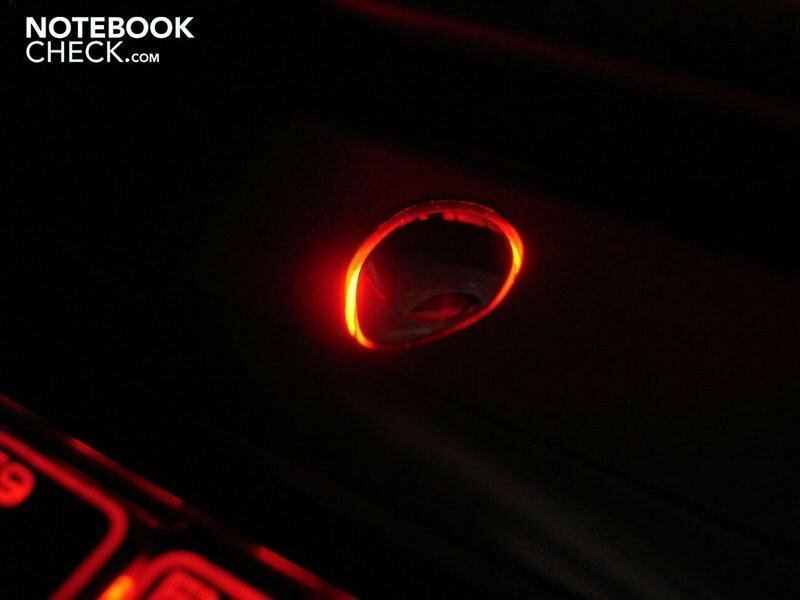 The elegant effect is even enhanced by the extensive lighting. The very good display, the over average sound and the lavish supplies can also distinguish themselves from the competitors. Overall, it's just enough for a very good rating. 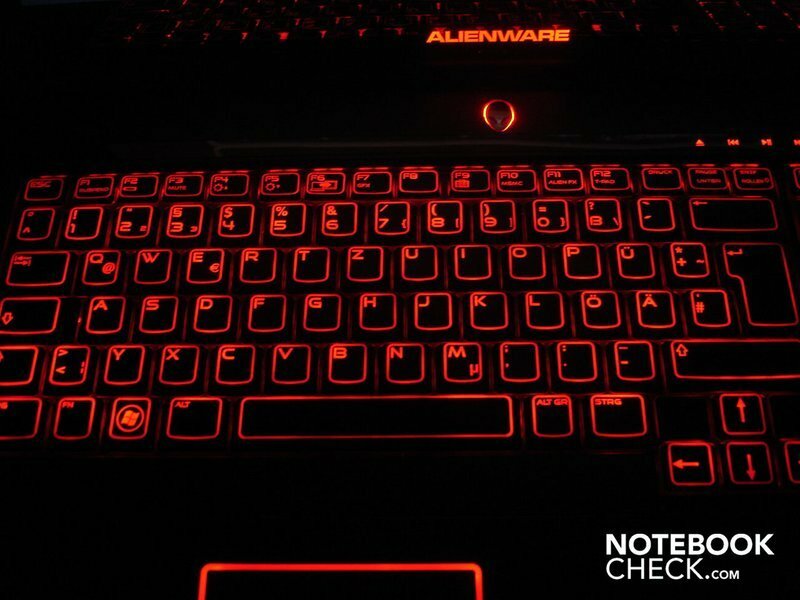 Demanding and noise resistant gamers, who are looking for an elegant and efficient desktop replacement and aren't put off by the high price can take hold of the Alienware M17x. The design, the materials, the workmanship and the elegant lighting are awesome. The built-in display proves to have very good rates. Additionally, the extensive supplies and the good sound are convincing. 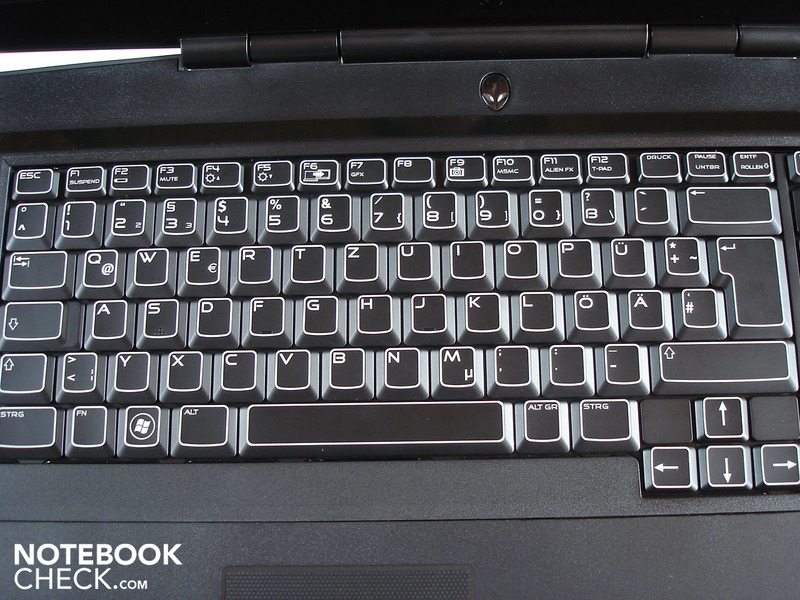 And finally, the given performance is excellent for a notebook. A quieter operating noise. The M17x is really very loud under load. How effortlessly Crossfire works in practice and that quite a lot of games evidently can benefit from Crossfire. 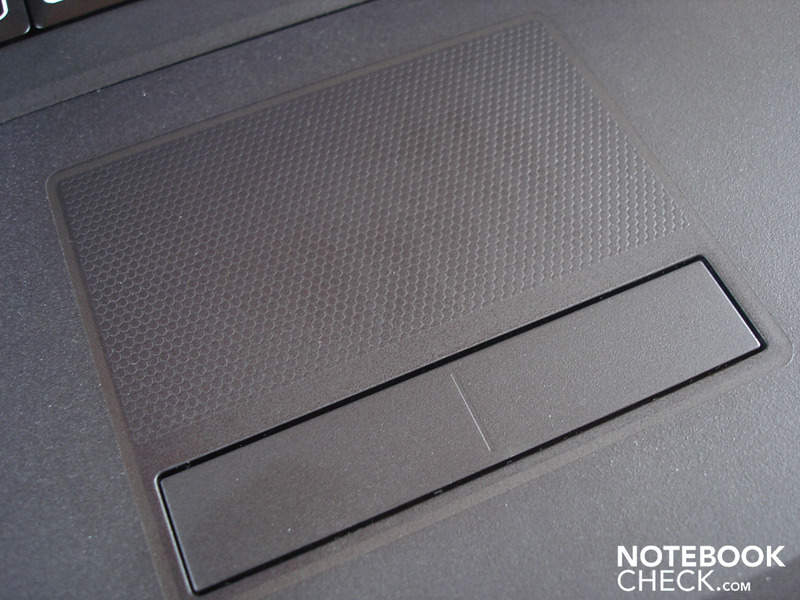 Also, seen relatively, how cool the notebook stays even under load.